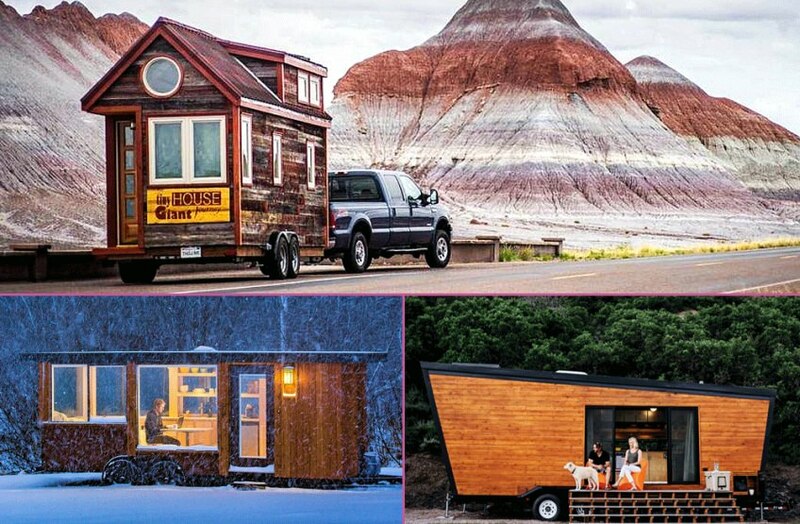 Tiny houses on wheels are rapidly getting popular as more and more people are getting bitten by wanderlust bug and the minimalist lifestyle. 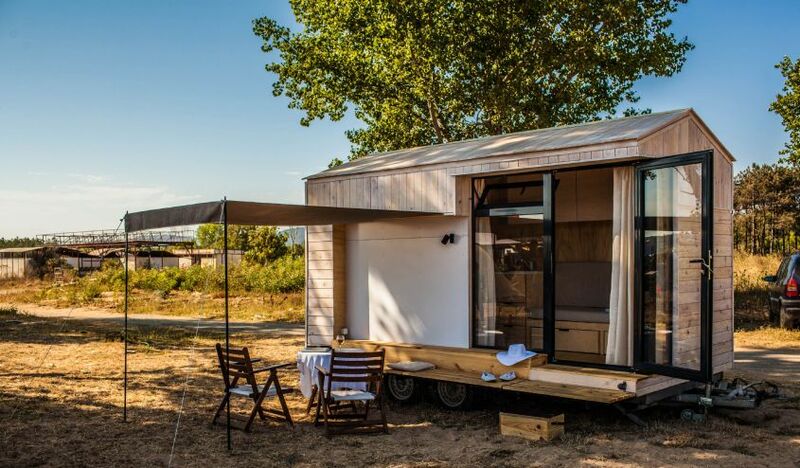 Alongside the biggest advantage of portability, most of them are eco-friendly and quite economical than traditional homes, making them an ideal choice for those who travel frequently. 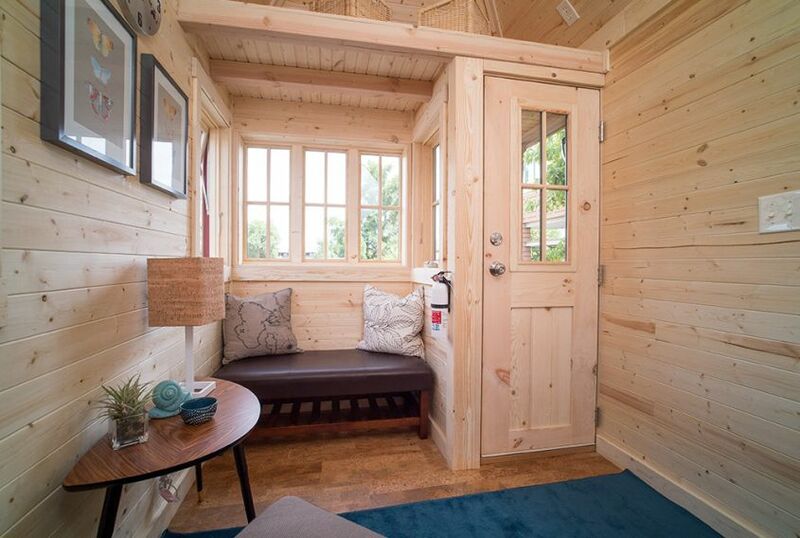 Another obvious advantage of a tiny house is a lesser amount of time required to maintain the overall space. Of course, there are some drawbacks as well, hitting the road makes you forget them all. 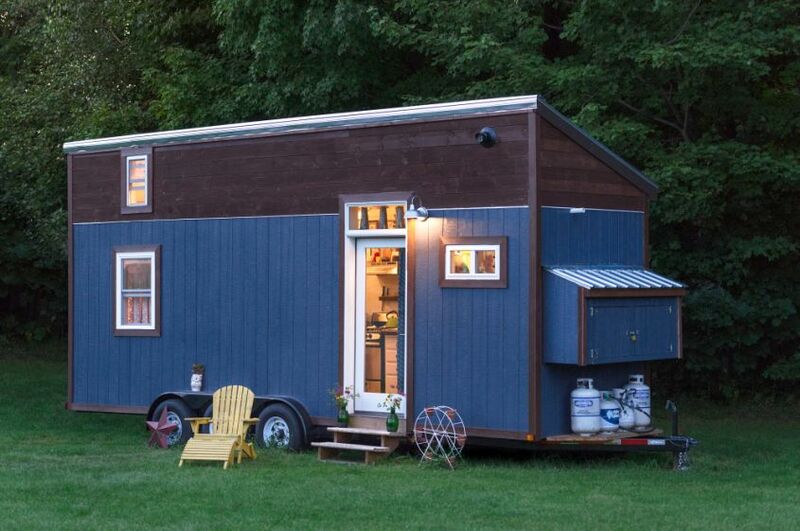 Our list includes some of the best tiny houses on wheels that might inspire you to take that once-in-a-lifetime road trip quicker and better. Built by Bulgarian architect Hristina Hristova, Koleliba is an oiled-plywood box with broad glazing and a glass door that slide out to let in plenty of fresh air and natural light. 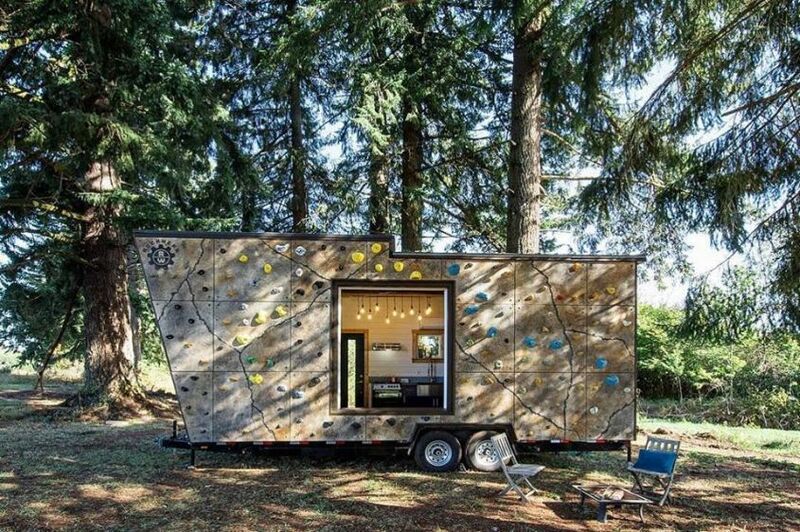 The wood-clad exteriors easily blend with natural surroundings, while white oiled cladding and plywood keep the interior space connected with nature. 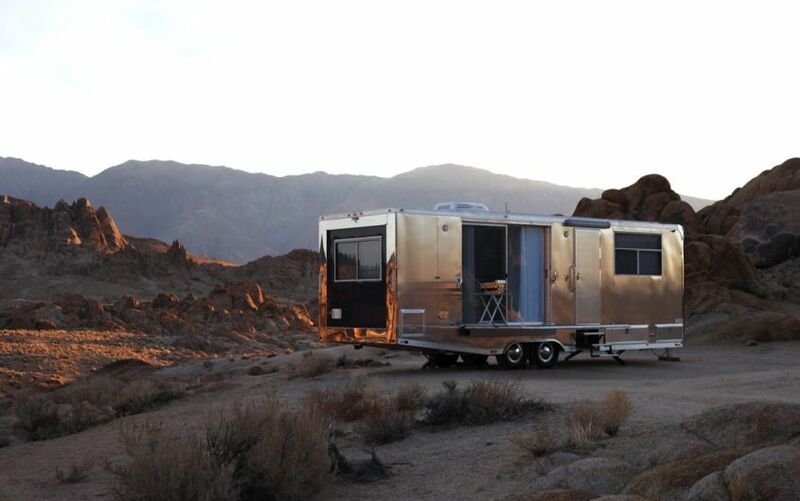 Featuring aluminum body and double-paned windows, Living Vehicle is an incredible creation by Californian architect Matthew Hofmann. 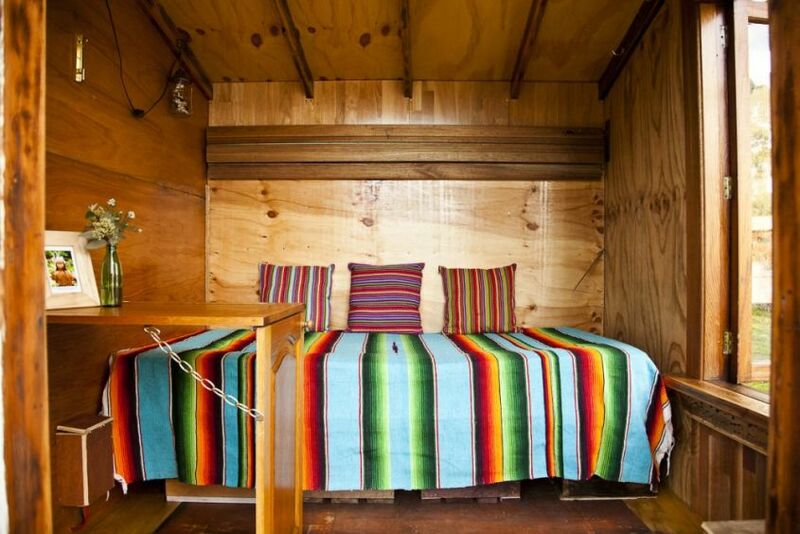 It comes fully furnished and can comfortably accommodate a family of six. There are smart features, solar panels, and a security system too. 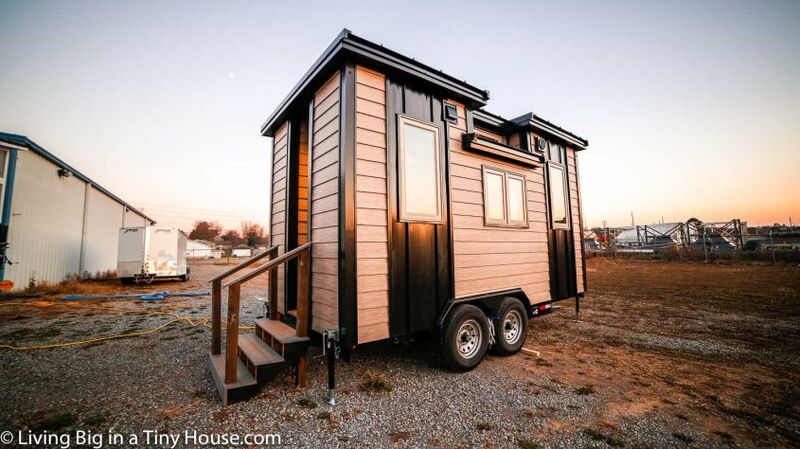 This tiny towable dwelling has two bedrooms, living room, kitchen, bathroom, and a small recessed porch. On the inside, there are wood-paneled walls and ceiling to match the wood style flooring. 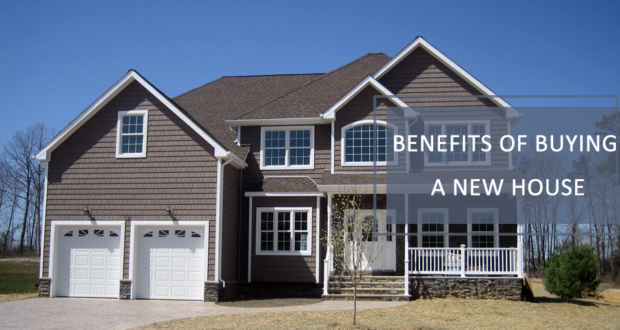 The hipped roof design also gives it an overwhelming appeal. 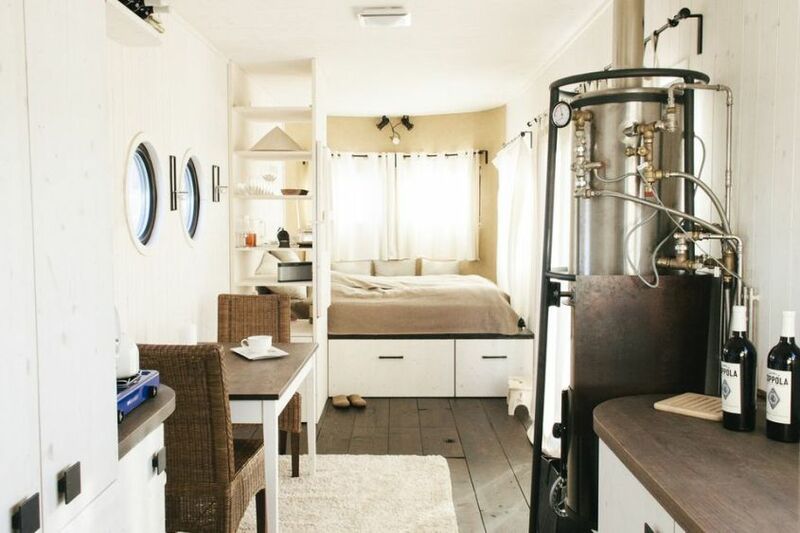 This innovative tiny house on wheels is just 5 meters long but is cleverly packed with all required features to make it a fully functional home. 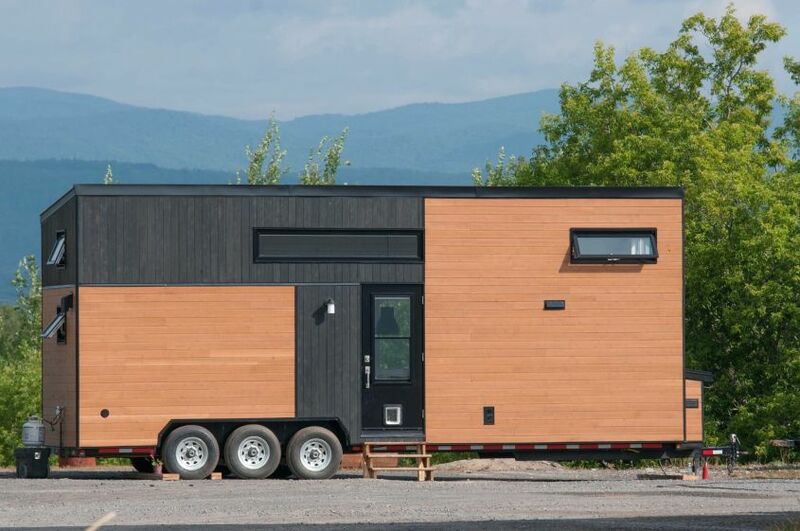 Made in collaboration with Tiny House Chattanooga, it features steel exteriors with a combination of standing seam metal and wooden siding. Another highlighting feature is the Amazon Alexa compatibility, which allows controlling lights, door locks, security camera and sound system on voice command. On the inside, high ceilings, a plenty of wooden details and modern furnishings ensure comfort and style. 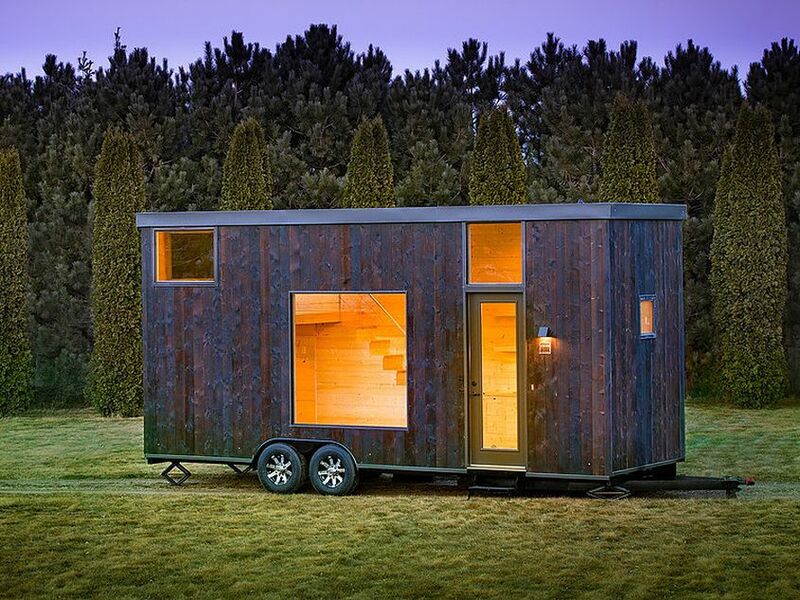 This two-story, tiny house on wheels is wrapped in wood charred using the Japanese Shou Sugi Ban wood-preserving technique. The living room, kitchen and bathroom are housed on the first floor, while a wooden staircase leads to sleeping lofts above. There are a number of big windows, adding a feeling of spaciousness. 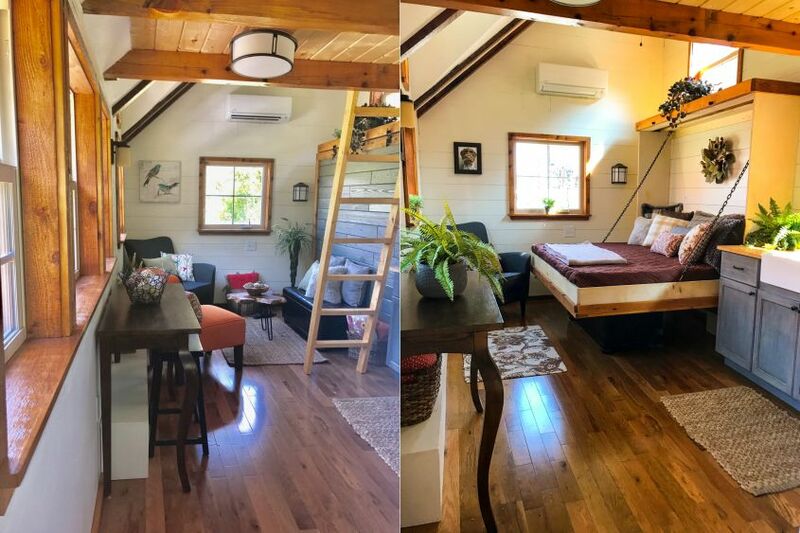 This rentable tiny house in Berkeley, California is equipped with all essential amenities required for a comfortable stay. The arched roof, and a skylight above the bedroom loft are some of its unique features. It can accommodate up to three persons at a time. 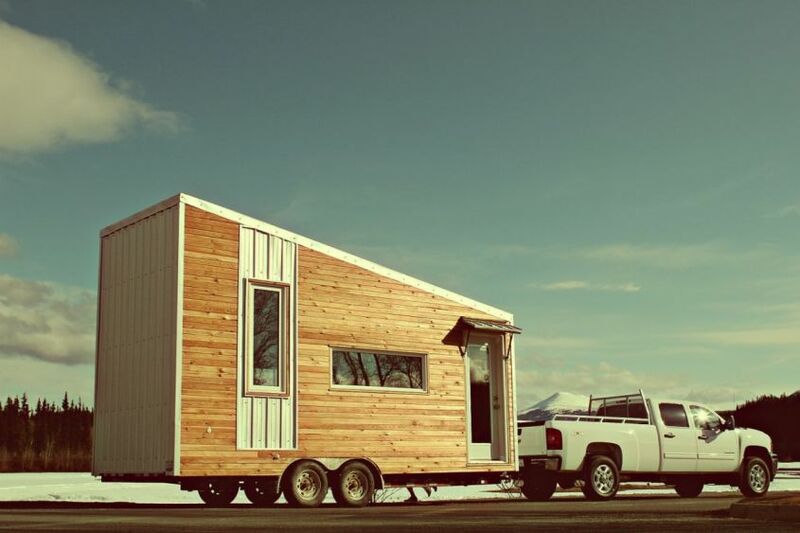 This mobile tiny home is based on a triple-axle trailer. It is spacious, however, can be hard to tow it around due to its elongated design. This makes it ideal only for those who aren’t going to tow it around very often. 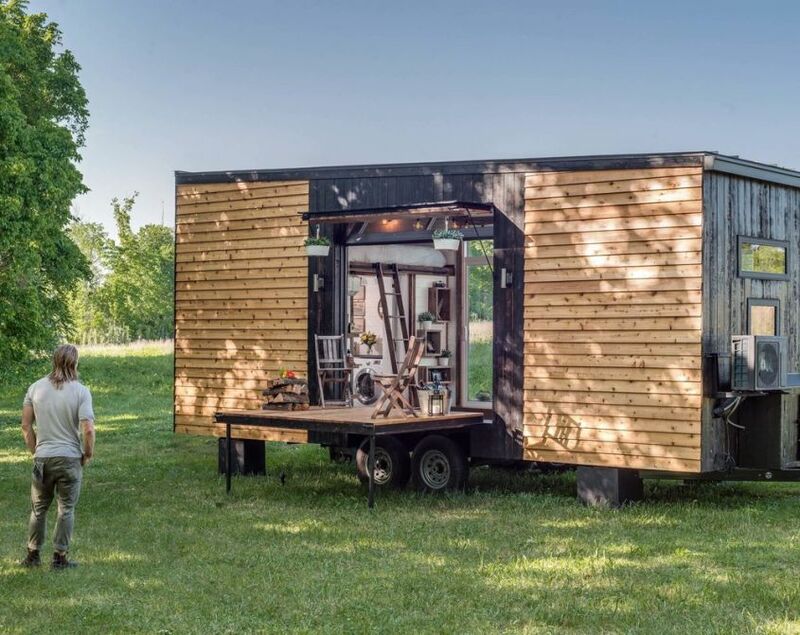 This luxury tiny home by Nashville-based New Frontier Tiny Homes cleverly utilizes 240-square-foot area to include all modern-day amenities in a small space. 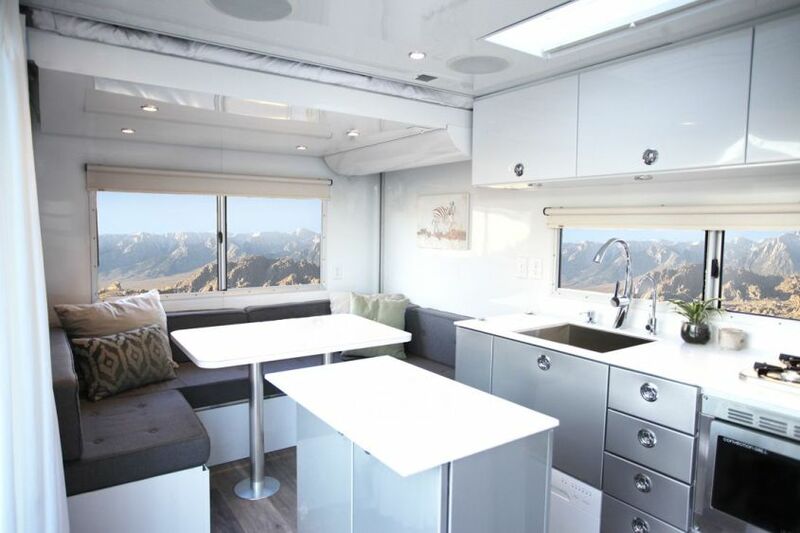 It has several foldable exterior elements like roof, deck and awning, which can be kept open in order to let in more natural air and light. Inside, the transforming furniture helps get most out of limited interior space. 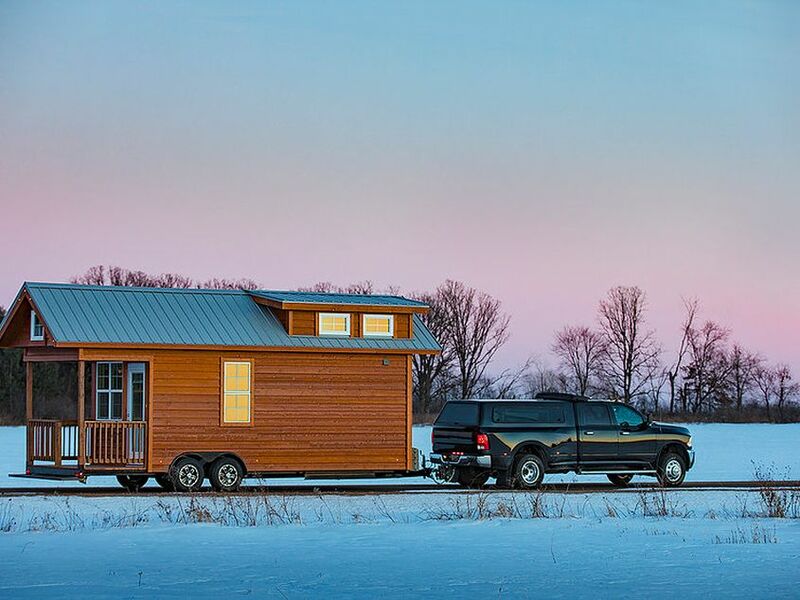 Covered in white pine, stained western red cedar and steel cladding, this 24-foot-long tiny house on wheels promises a long life. It has a small living room area with a custom couch and table, a mid-size kitchen, bathroom with tub and a private bedroom loft. 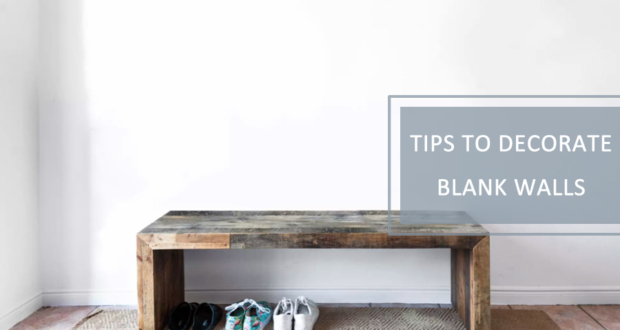 Furthermore, storage spaces are scattered throughout the home. 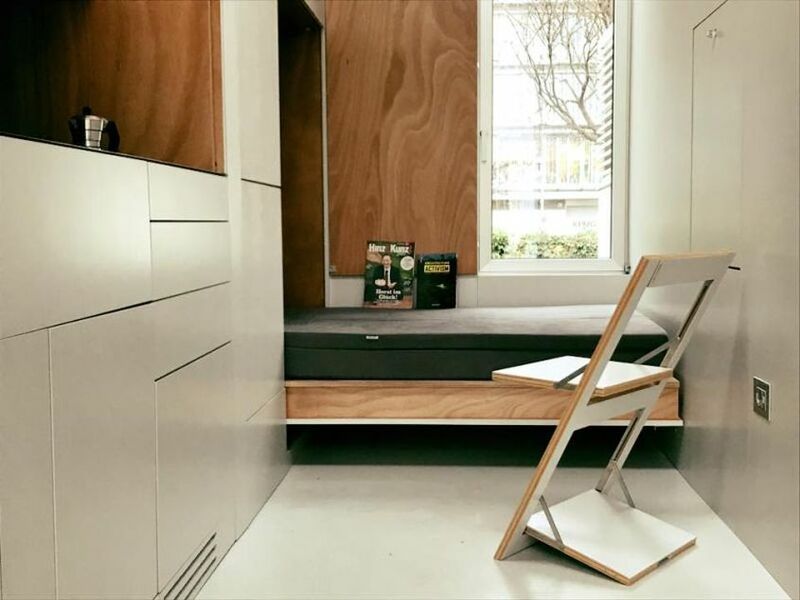 Combining minimalist design with transforming furniture elements, aVOID is a mind-blowing tiny house on wheels designed by Italian architect Leonardo Di Chiara. 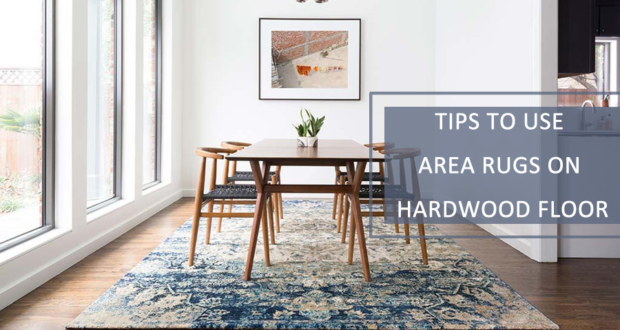 There are retractable walls that hide behind furniture and other required accessories to let homeowners make ideal use of the available floor space. 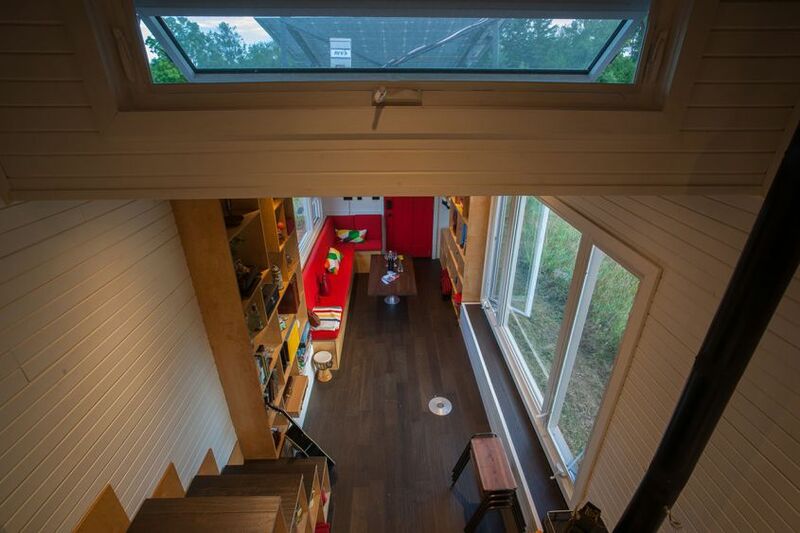 All living spaces are neatly tucked into the nine-square-meter space. 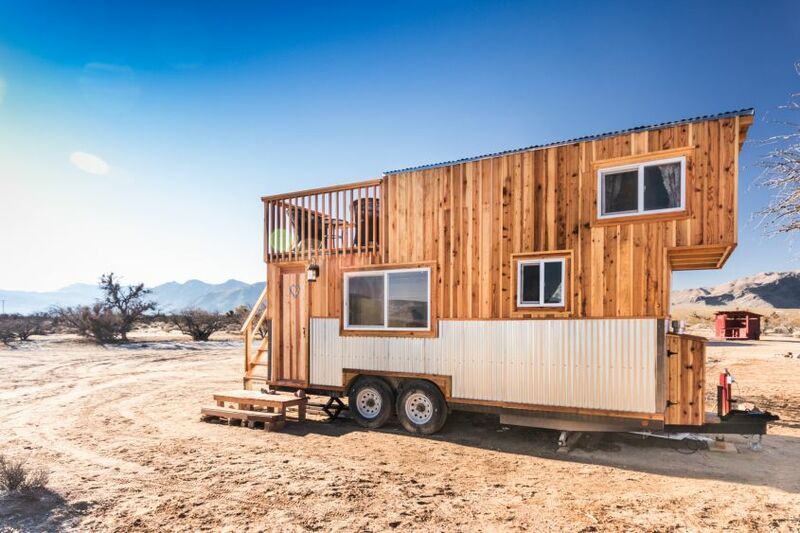 This simplistic tiny house on wheels sits on an 8×24 trailer and is made from salvaged materials like corrugated metal sheeting on the exterior and a large metal tub in the bathroom. 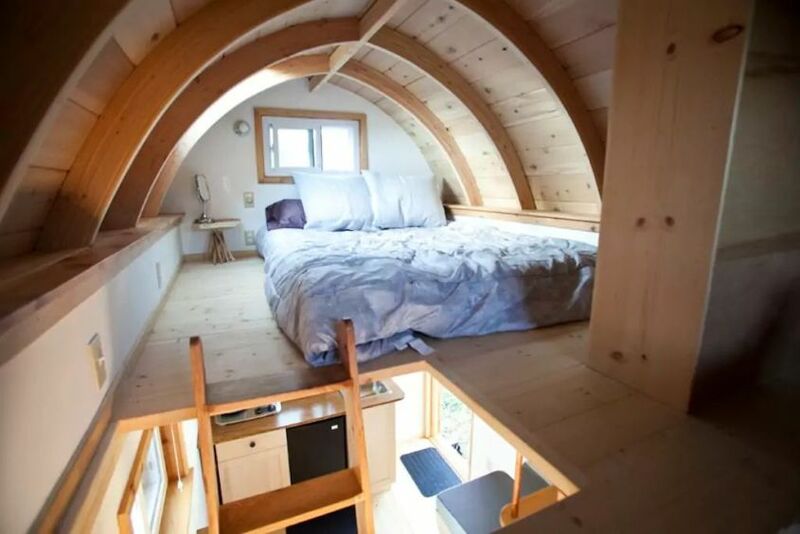 It offers about 200-square-feet living space and a loft bedroom accessed by a spiral staircase. 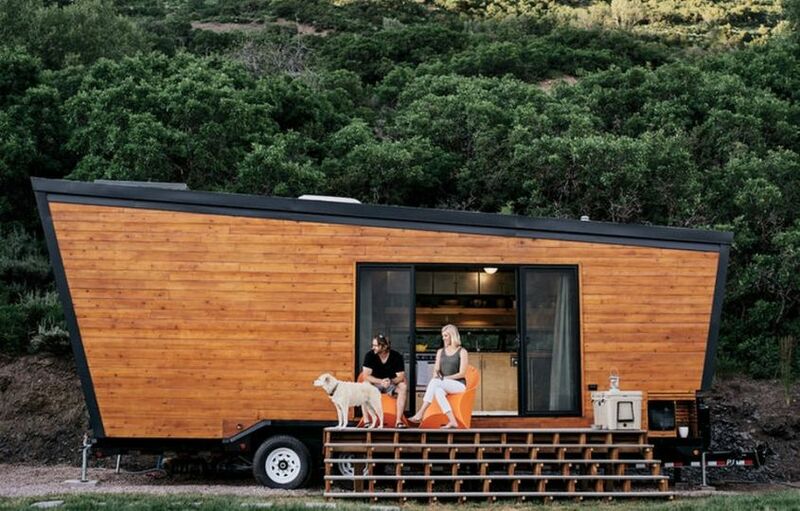 This tiny house on wheels is built by US-based couple Alexis Stephens and Christian Parsons of Tiny House Expedition in order to downsize their lifestyle. 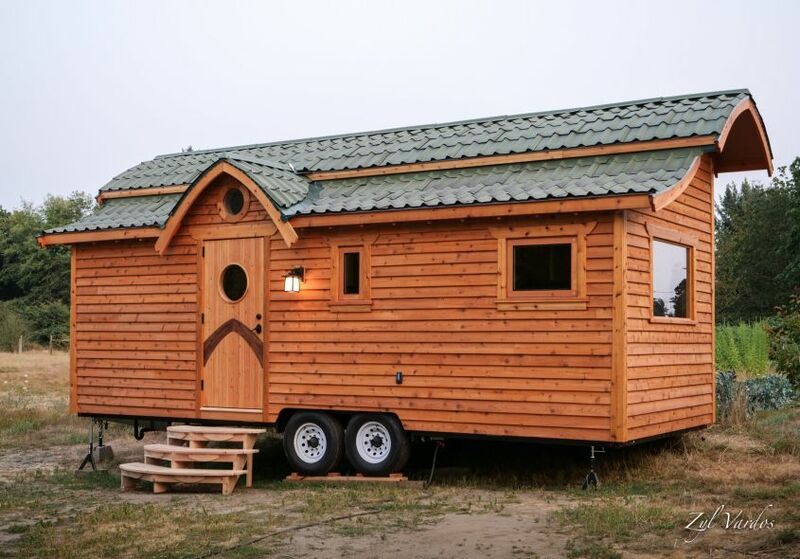 Measuring 130-square-feet, it has a cozy cabin, kitchen, two lofts, and a bathroom complete with shower. They have spent about US$20,000, which seems to be nothing when compared with the places they have traveled in it. 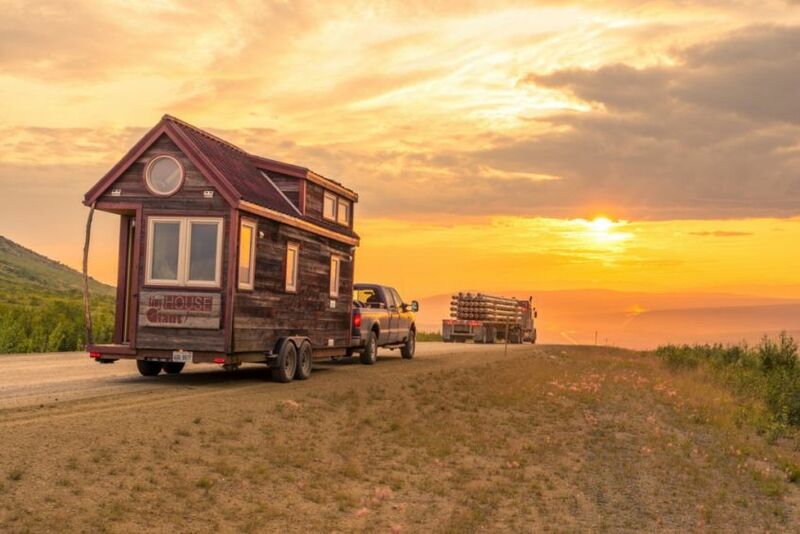 With more than 45,000 miles on the clock, it is being touted as the most-traveled tiny house in the world. 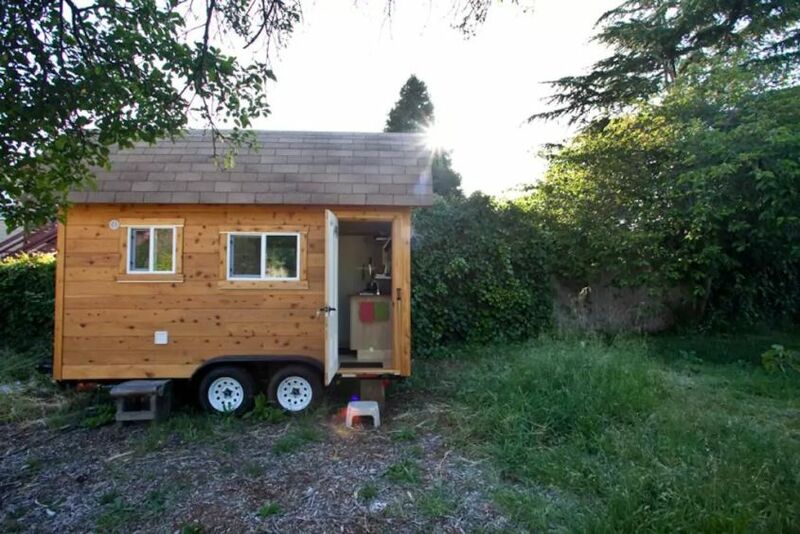 It is suitable for those who want to enjoy conveniences of a regular house in a tiny house on wheels. Its exterior is composed of stone grey corrugated steel with a galvalume standing seam roof. There are plenty of windows to bring in enough natural light and surrounding views. 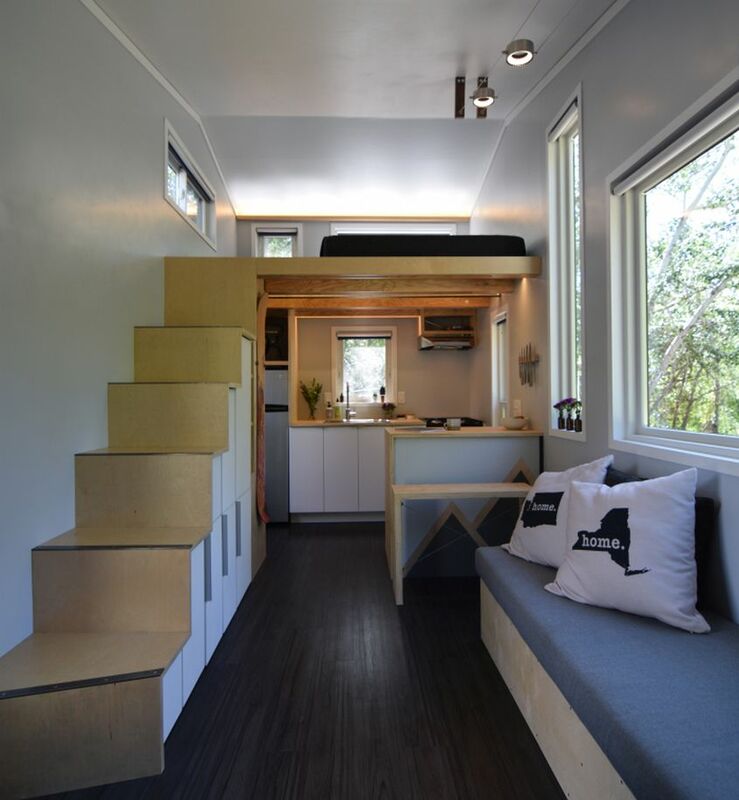 Just like other tiny houses on wheels, it also has a staircase that provides additional storage space. 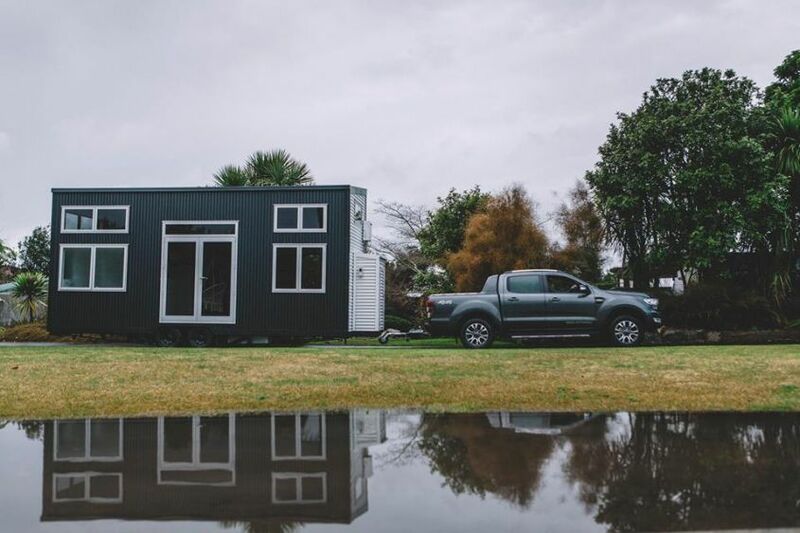 Built by New Zealand-based tiny house builder Build Tiny, it is currently available as Airbnb vacation rental. 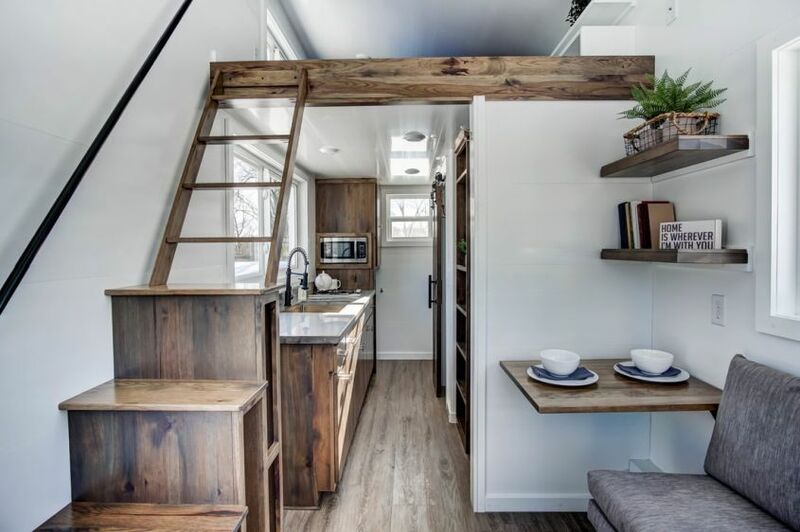 The Millennial tiny home on wheels employs some innovative space-saving design ideas including a retractable staircase, underfloor storage, and a home office. 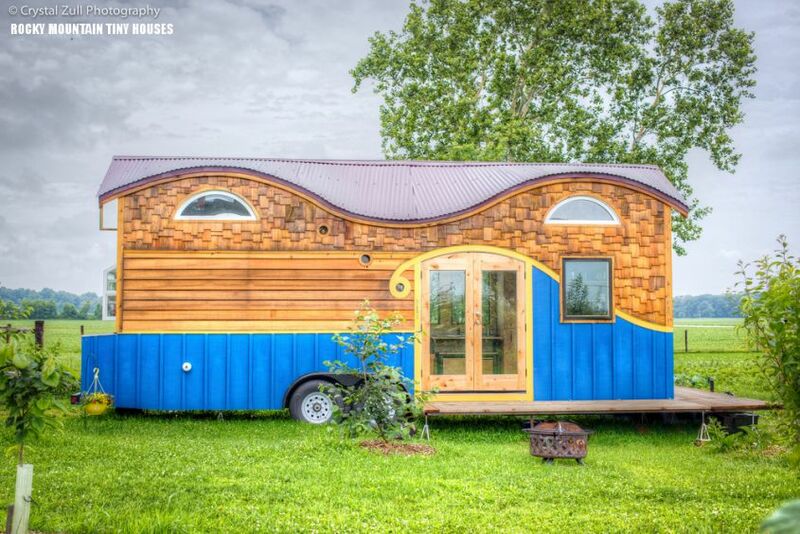 Made by tiny house builder Zyl Vardos, this mobile home features wood-paneled exterior, Onduvilla-tiled roof and a number of curvy windows. 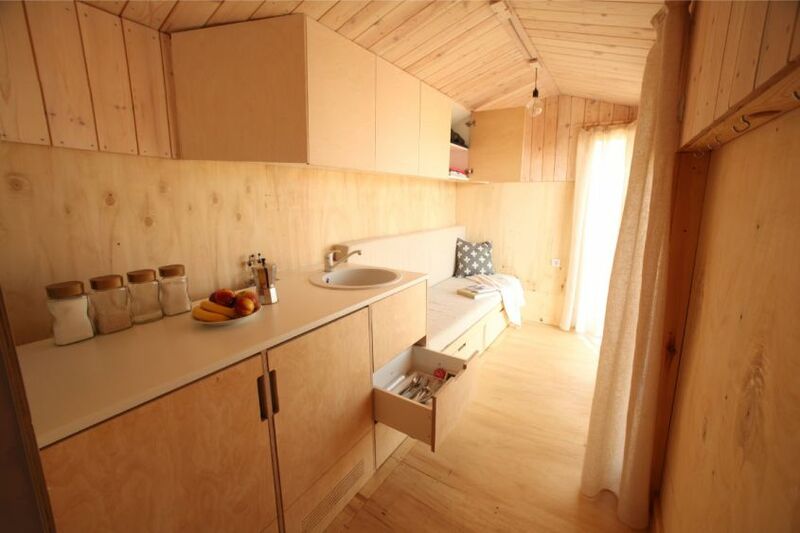 It has a living area, fully-equipped kitchen, two bedrooms, and a bathroom complete with shower and toilet. 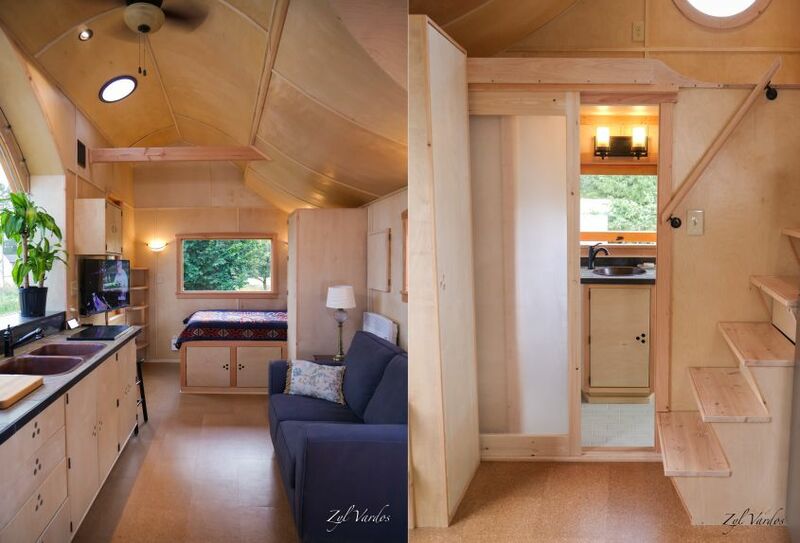 The contoured design of roof and windows are the most attention-grabbing details of this tiny house on wheels. 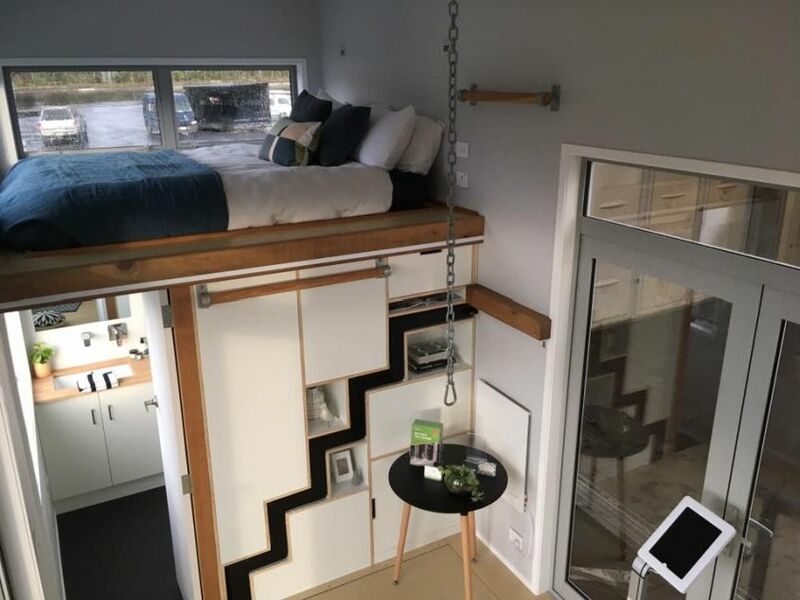 Made by an Austrian company, this self-sufficient mobile home offers unique living experience in just 25-square-meter of living space. 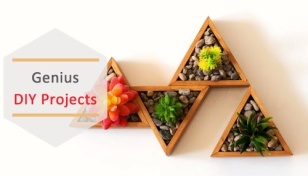 It is made using natural and recycled materials and has a variety of sustainability features as well. Its rounded frame clad in larch wood brings unique essence to its exteriors. 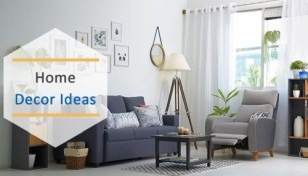 Inside, there are plenty of multifunctional space-saving features to make most out of the available space. 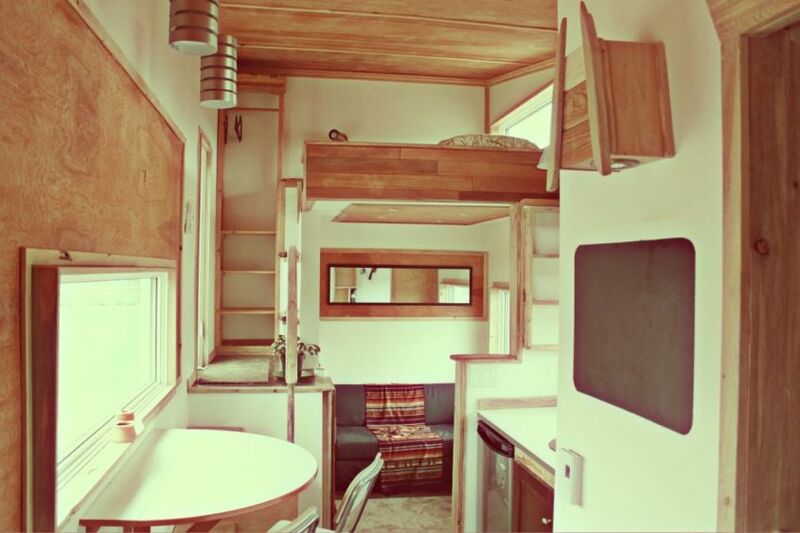 The Peacock by Rob Millar of Old Hippie Design is a classic mobile home featuring an impressive rooftop balcony accessed via a wooden staircase at the back. The interiors are styled in a certain south-western flair while exteriors are finished in wood and corrugated metal siding. 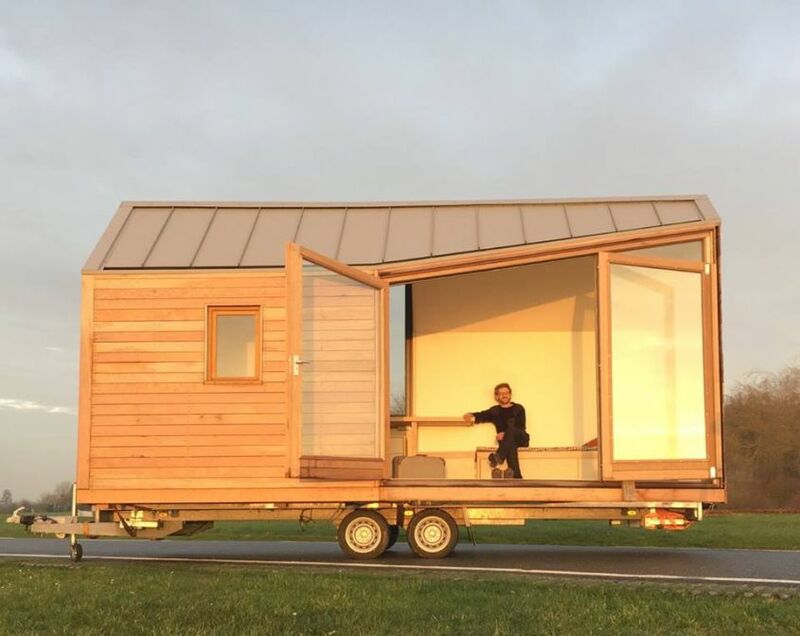 The minimalistic wooden building envelope combined with large fold-out glass doors add unique aesthetics to this tiny house on wheels. 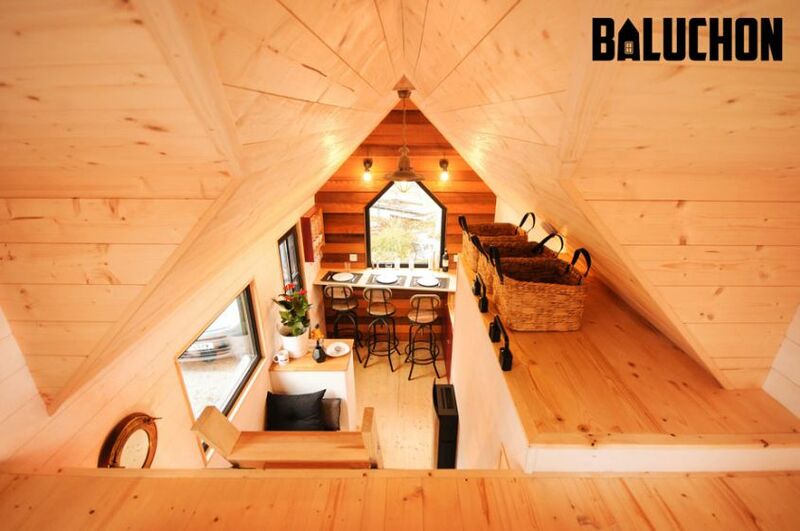 It is made from CLT boards that ensures thermal efficiency and sound insulation. 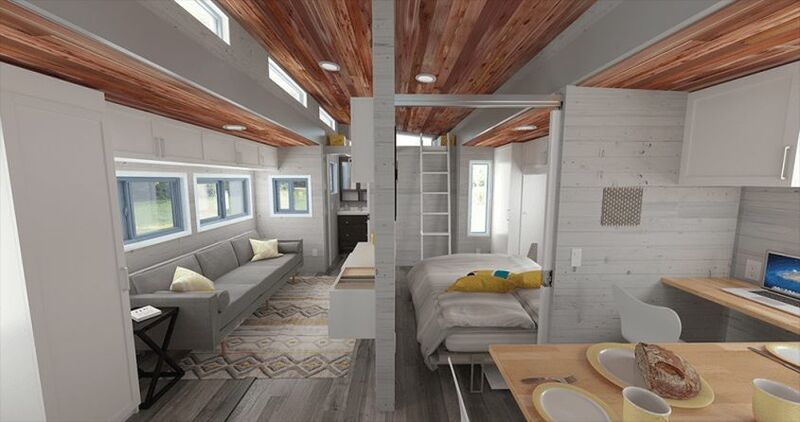 There is complete with living area, kitchenette, bathroom, and a cozy sleeping loft. 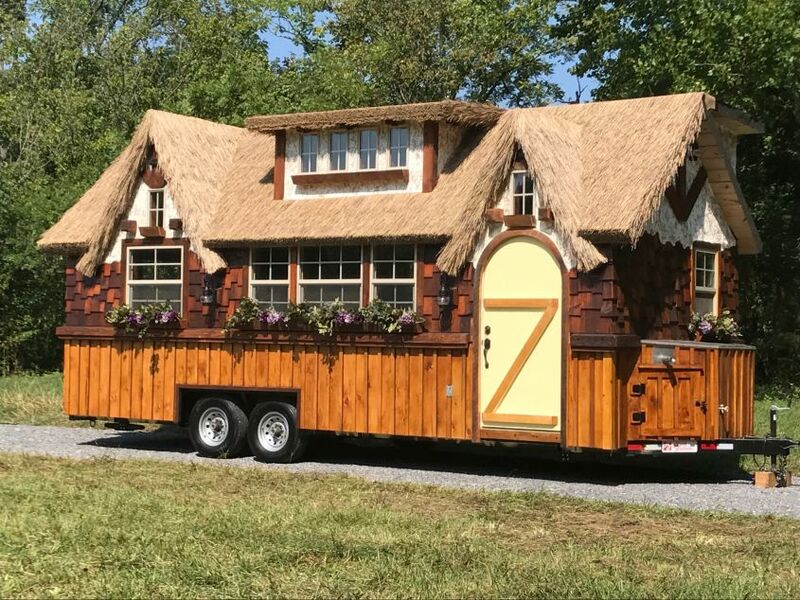 This creatively-designed tiny house on wheels featuring hobbit-style round door, curved roof and shingled exteriors is a mystic creation by Tennessee-based Incredible Tiny Homes. 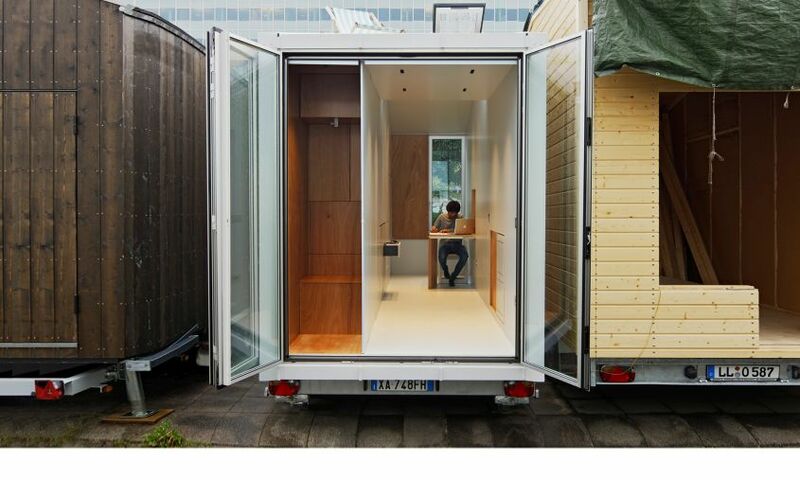 It is based on a double axle, 20-foot (6 m)-long trailer that offers a total 160-square-foot floor space. The interiors can be outfitted with the desired custom-built furniture, appliances and lighting. 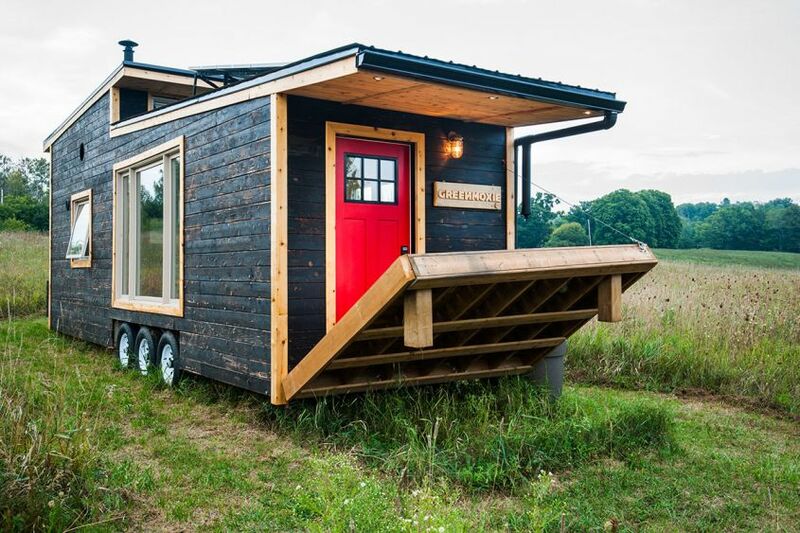 Oregon-based company Tiny Heirloom has built this tiny house for a Mississippi couple, Breck and Kelsey. A lot of luxury features are included, as they did not want to sacrifice their original lifestyle. 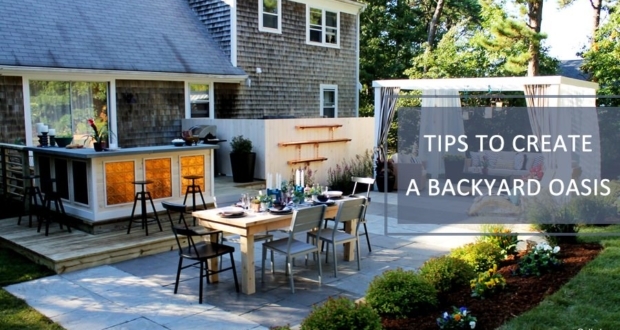 The exterior climbing wall, spa tub, walk-in closet, retractable dining table, arched sliding door, and a custom chandelier are some of its cool features. 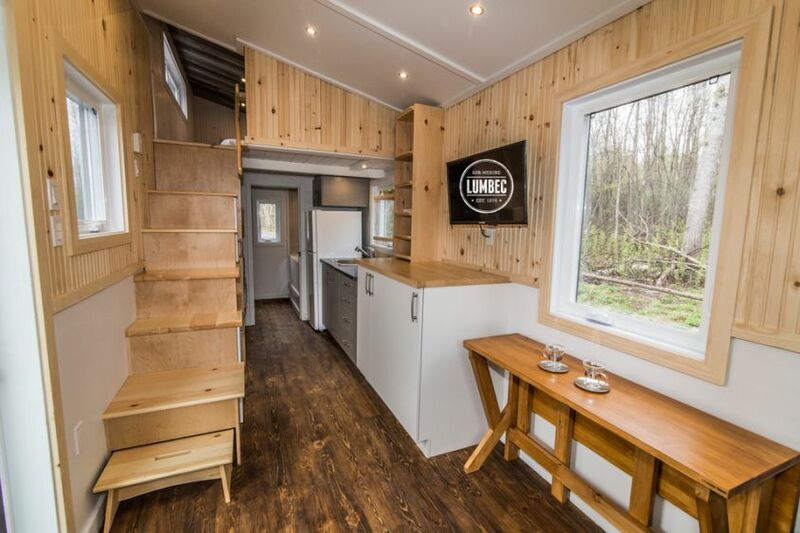 David Shephard, the co-founder of Toronto-based Greenmoxie, and green building consultant Ian Fotheringham have built a contemporary tiny house on wheels with modern and eco-friendly features. It features a drawbridge deck that can be electrically lifted or lowered to create additional outdoor space. The dual-pitched black metal roof and spray foam insulation keep the entire space pleasing and comfortable all year long. 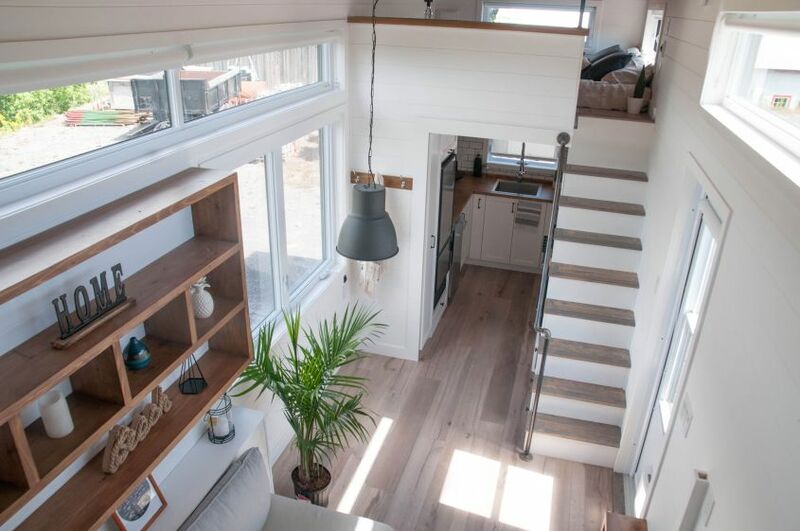 This tiny house inspired by Californian style is built by Quebec tiny house builder Minimaliste. 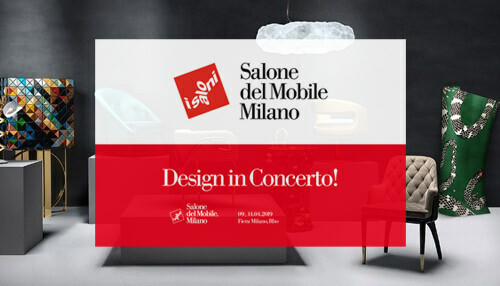 From material and interior design to furniture and appliances, all important design elements are decided by customers. 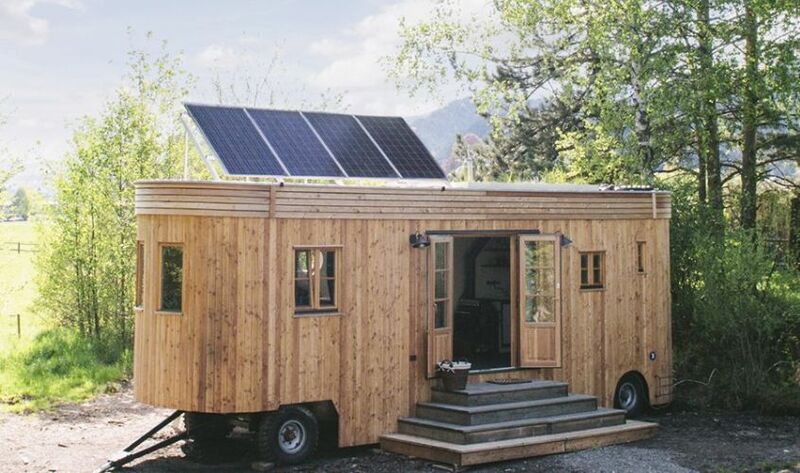 An off-grid system of 2kW is used to fulfill power requirements of the home. 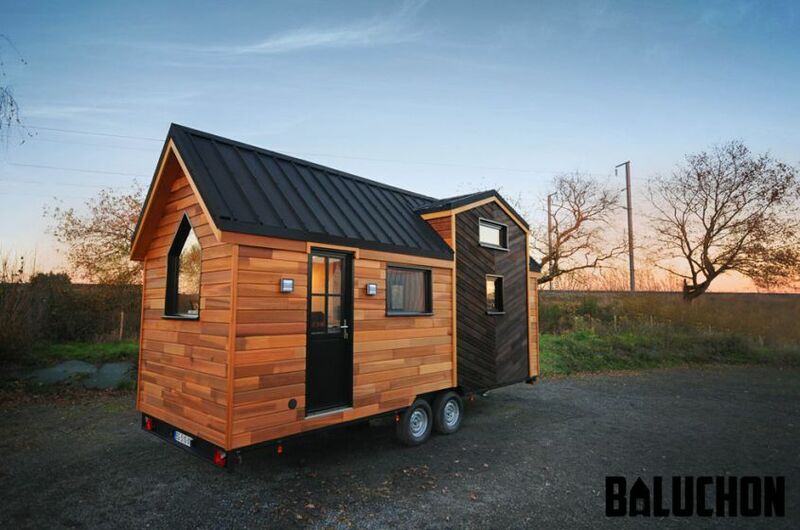 The Calypso tiny home by Parisian company Baluchon is not only appealing from the outside but also equally pleasing from the inside. 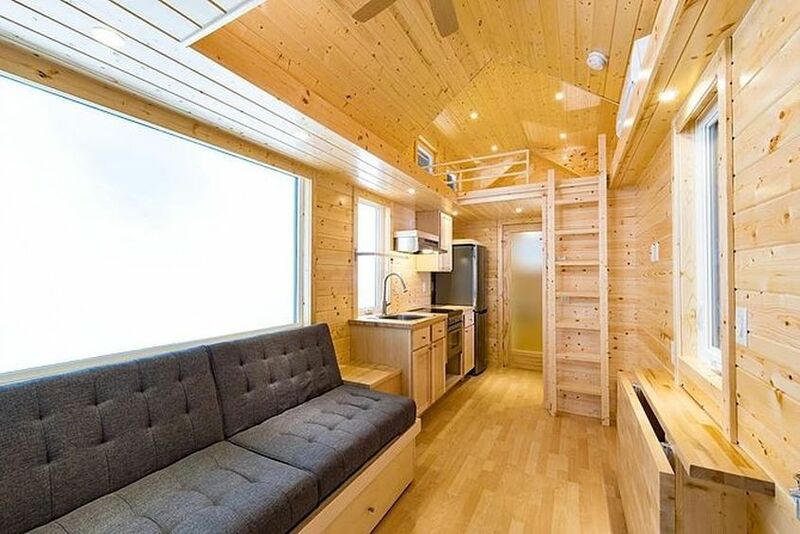 It can house up to four people comfortably. 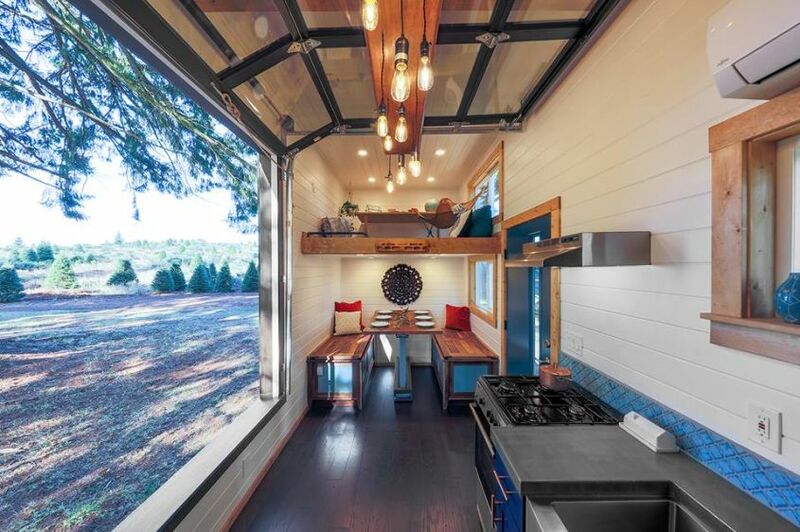 The unique roof design, side windows and cedar wood-clad exteriors are some beautiful design elements of this mobile house. 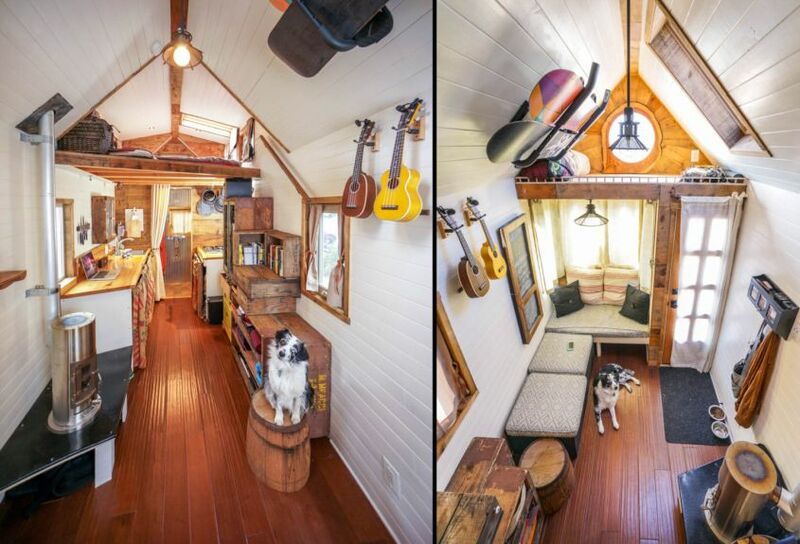 This colorful mobile home measures just 140-square-feet but looks roomy due to its space savvy interior design. 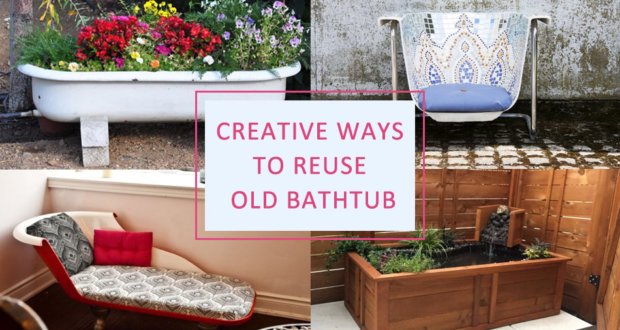 Designed by Frank Henderson and Paul Schultz, it combines modern design elements with ecologically responsible materials. Its unique exteriors are finished with multiple colored, corrugated fiberglass cubes and natural cedar panels. 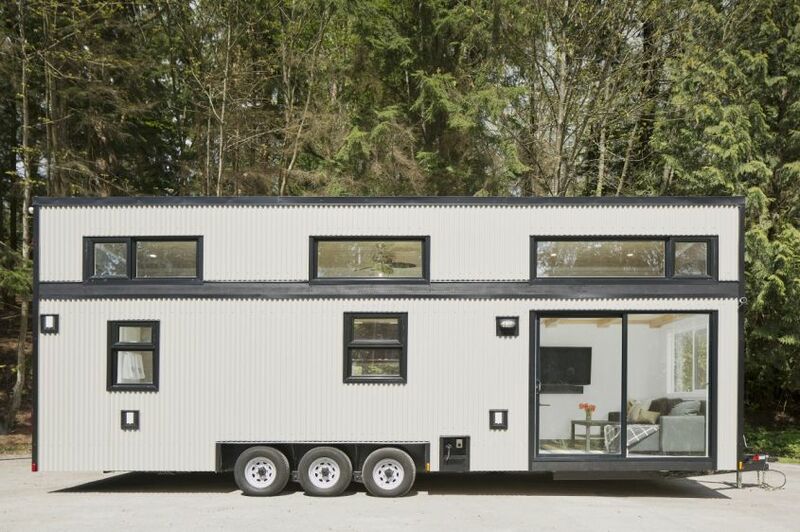 This brilliantly-designed mobile home, sits on a 24-foot-long, 8 1/2 f00t wide trailer. 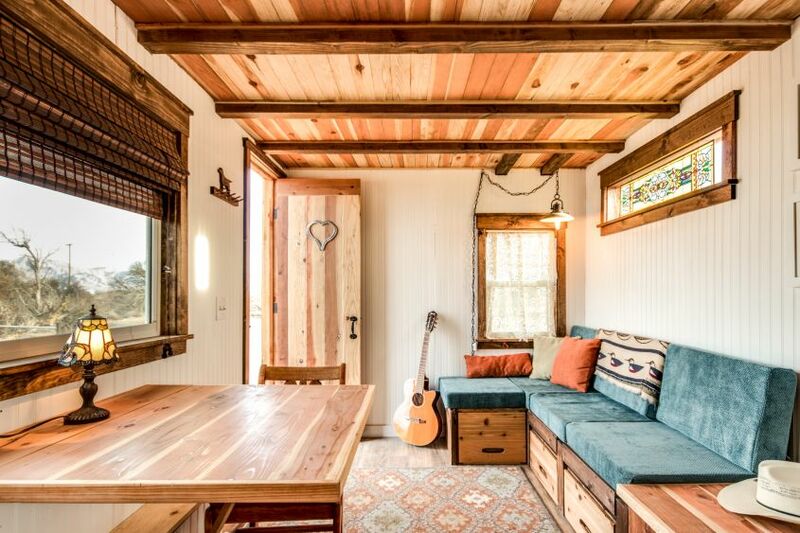 The exteriors are wrapped in standing seam metal while interior space is furnished with a lot of DIY projects from Ana White, including DIY elevator bed, folding table, multipurpose seating furniture, pipe coat rack, and sliding doors to a shelving unit. There is also a modular lounge that turns into guest bed easily. 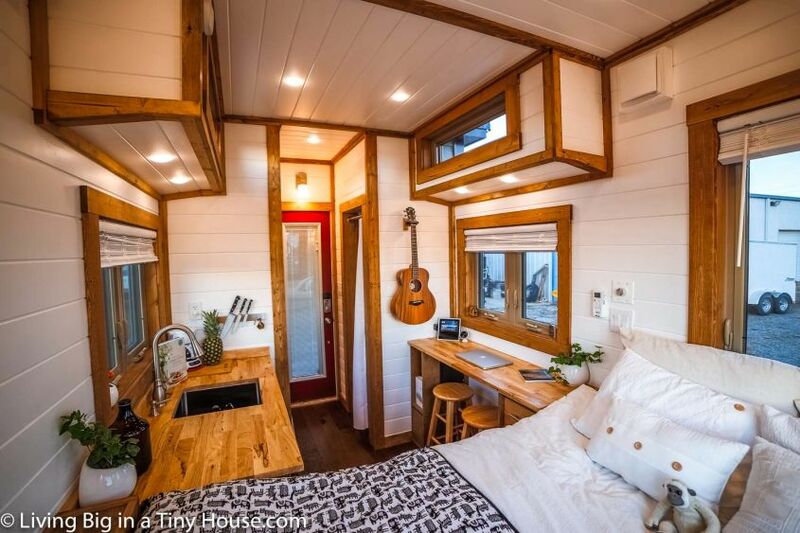 This incredible tiny house on wheels is another wonderful creation by Incredible Tiny Homes. It features a thatched roof system and exteriors covered in cedar shingles, board and batten panels. 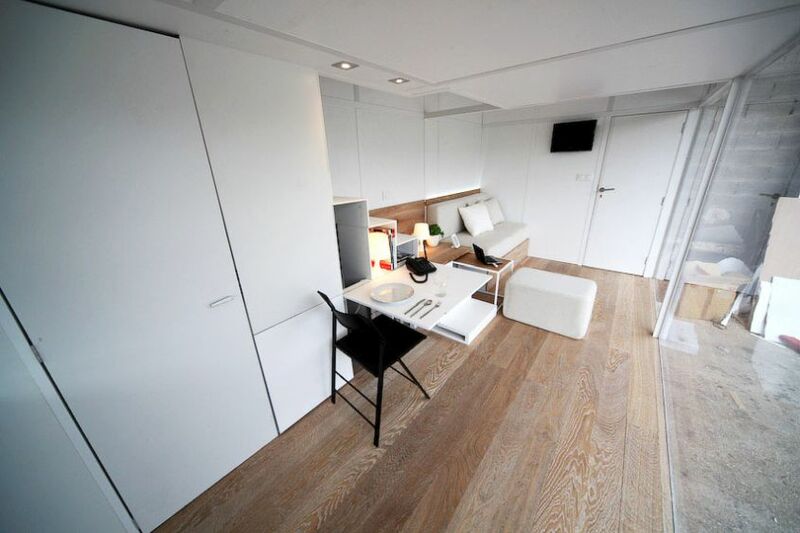 Inside, there is a retractable bed and a loft that can be used as home office or additional sleeping room. 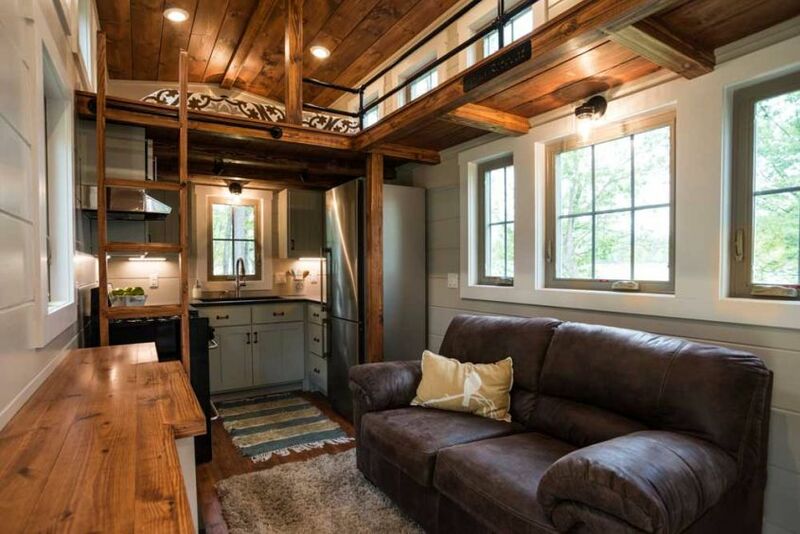 The exposed wooden beams on the ceiling add rustic appeal to the interiors. 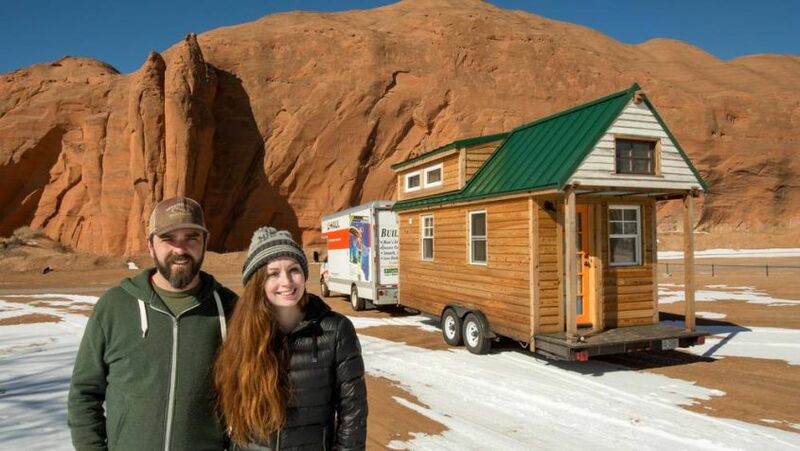 Californian couple Brian and Joni Buzarde have built this tiny house on wheels in order to pursue their passion for travel. The walls are made of SIPs, while exteriors are clad in cedar. All interior sections including walls, flooring, ceiling and kitchen cabinets are made from birch-veneer plywood. 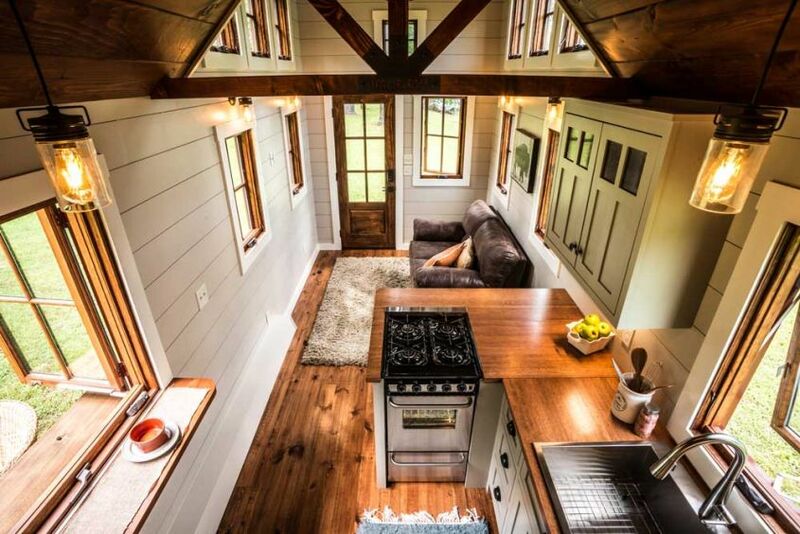 Escape is best known for its contemporary tiny house designs but this one boasts traditional style. 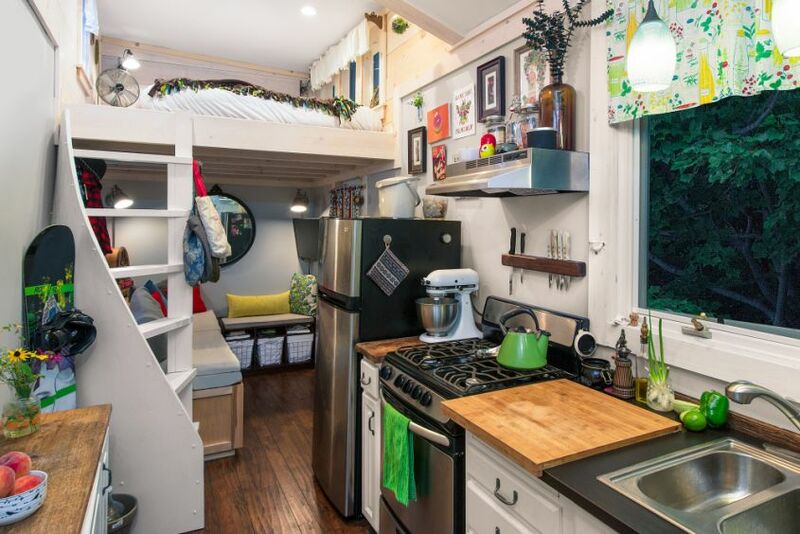 The huge sleeping loft with optional dormers and a kitchen nook with lots of storage are some great features of this tiny house on wheels. Its exteriors in pre-stained cedar siding are trimmed with steel accent and protective panels. 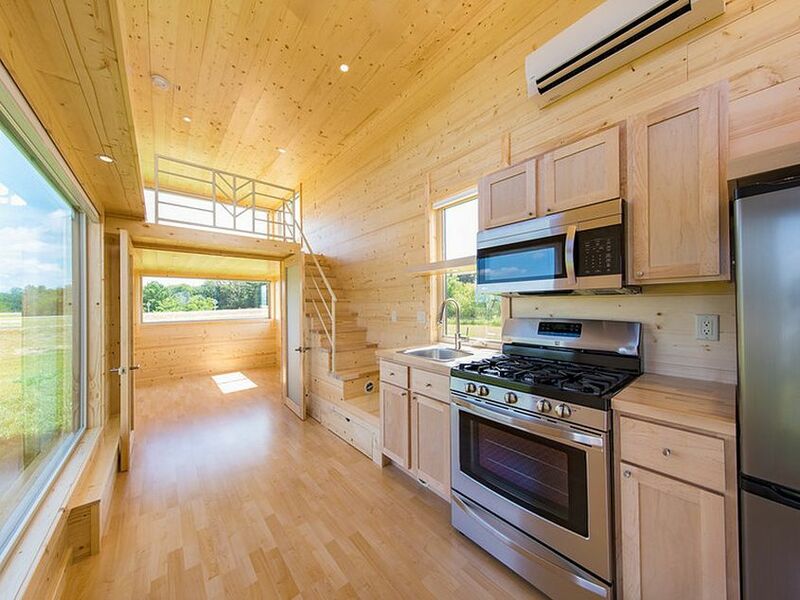 And, the interior space boasts pine wood detailing. 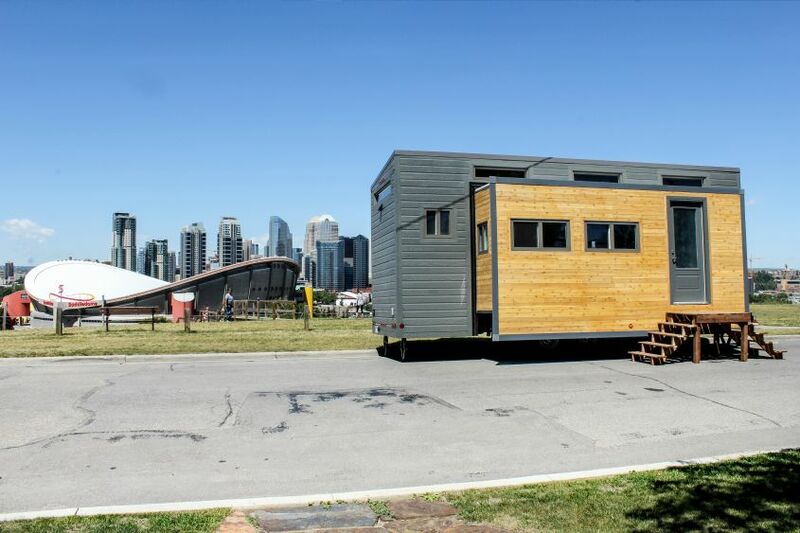 Built by Canada-based Zero Squared, The Aurora tiny house on wheels doubles interior space on the push of the button. Due to use of heavy construction like SIPs that are made from prefabricated polyurethane foam insulation wrapped in a vapor barrier, it is suitable for using throughout the year. Inside, there are complete white walls contrasting the wood-clad ceiling. 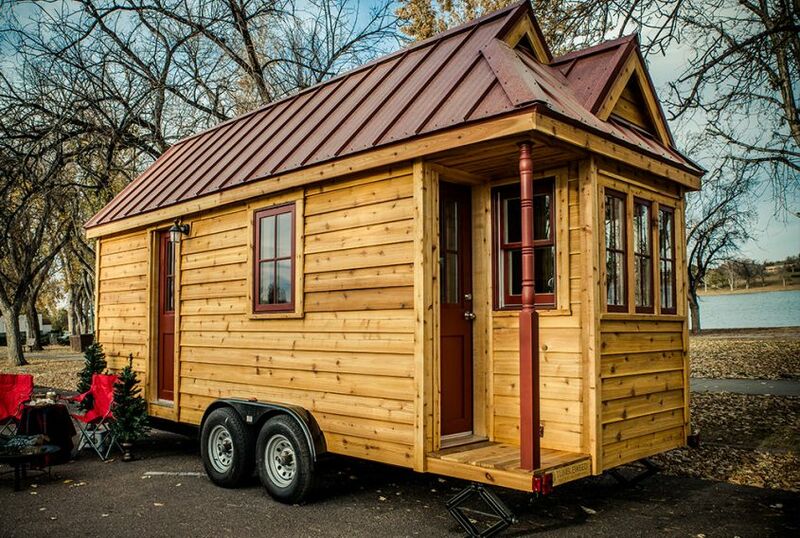 It is a larger tiny house on wheels built for a family of four by Colorado-based Rocky Mountain Tiny Houses. 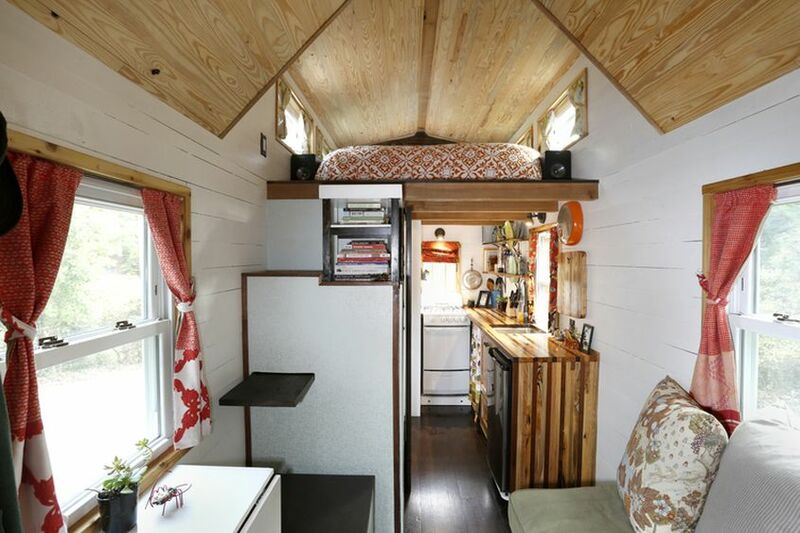 Sitting on a drop axle trailer chassis, it has an additional 4′ of headroom in the loft. The wavy shape of the roof brings whimsical aesthetics and helps to maximize height inside. 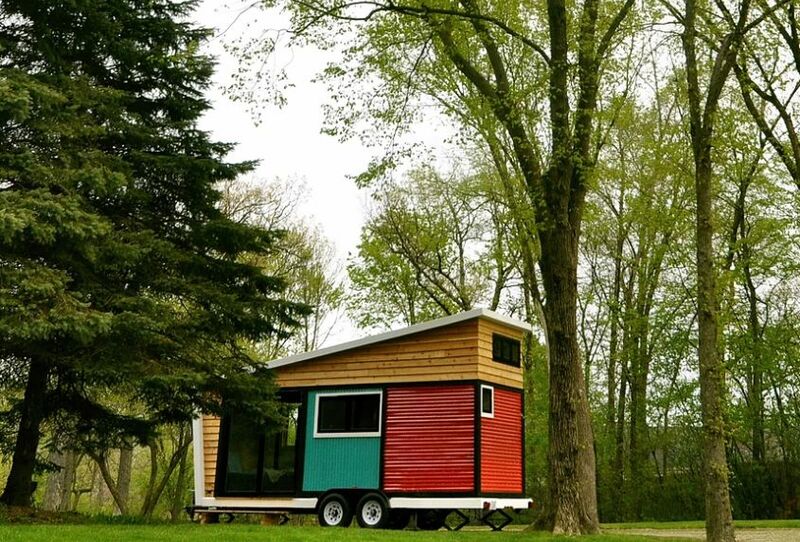 Colorful exterior is another eye-catchy design element of the tiny house. 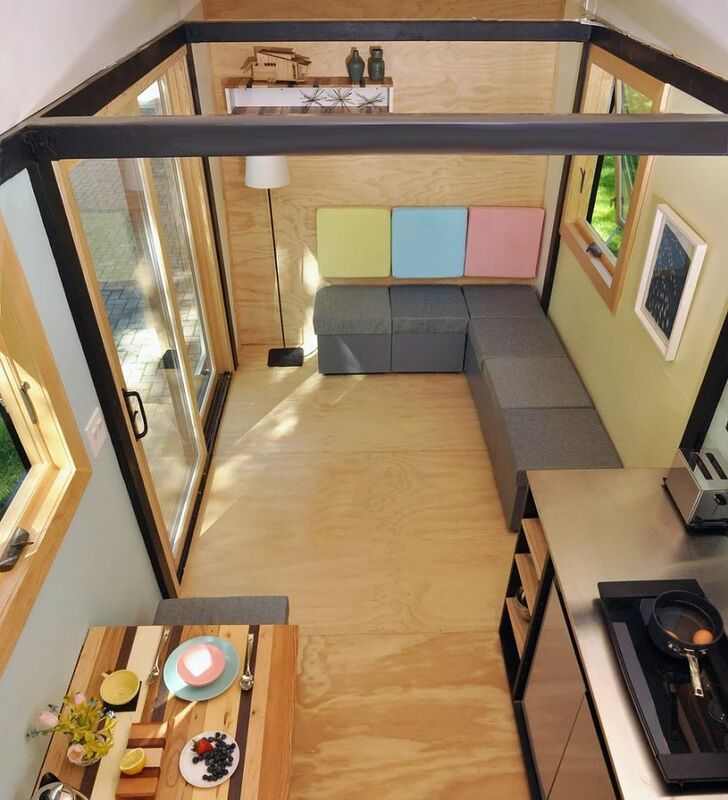 Aptly named Shed, this 204-square-foot mobile tiny house is designed and constructed by Washington-based couple Robert and Samantha to represent their lifestyle of simplicity. They have used 2×3 framing with continuous exterior insulation to high thermal performance. The wedge entry alcove corrugated metal siding and sleeping area lie above the kitchen are some other unique features of the Shed. 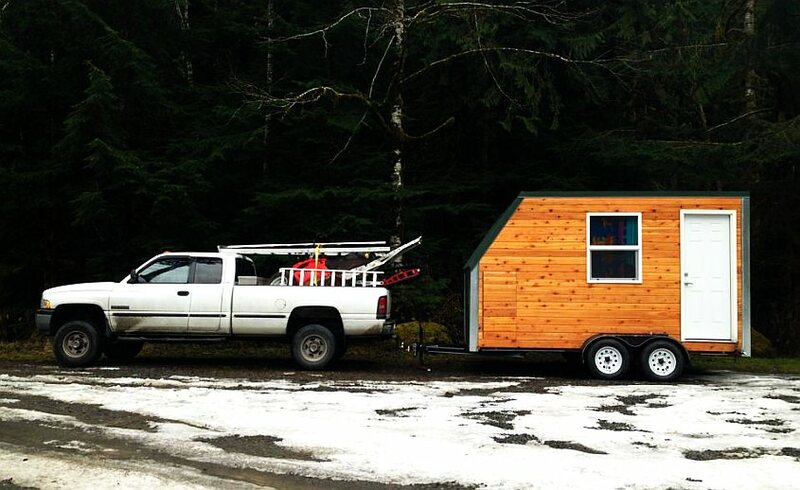 This 24’ x 8’ tiny house on wheels supports different lifestyles and environment conditions. It weighs around 10,000 lbs and can be towed with a one-ton pickup. 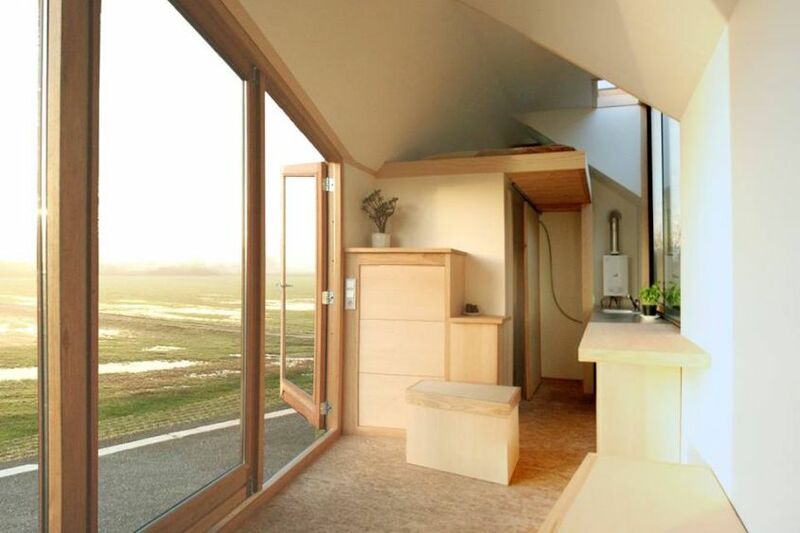 It has a first-floor bedroom, a fully-equipped kitchen and bathroom complete with a composting toilet. 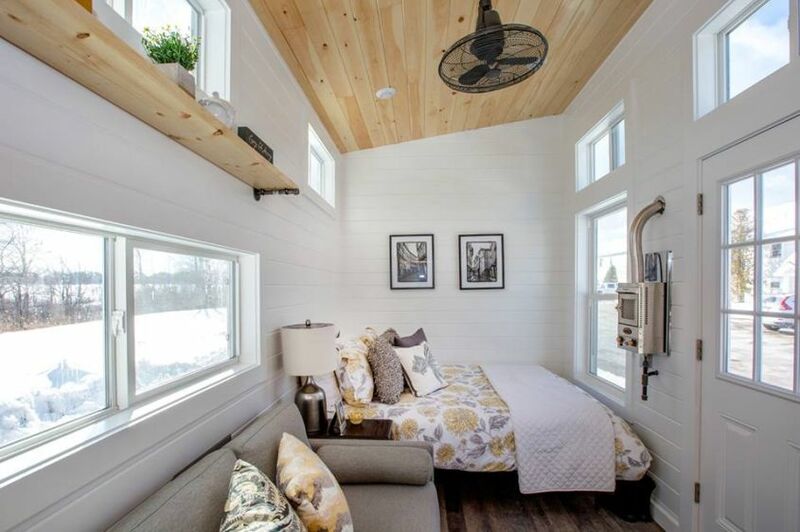 White shiplap interior walls is an interesting design feature. 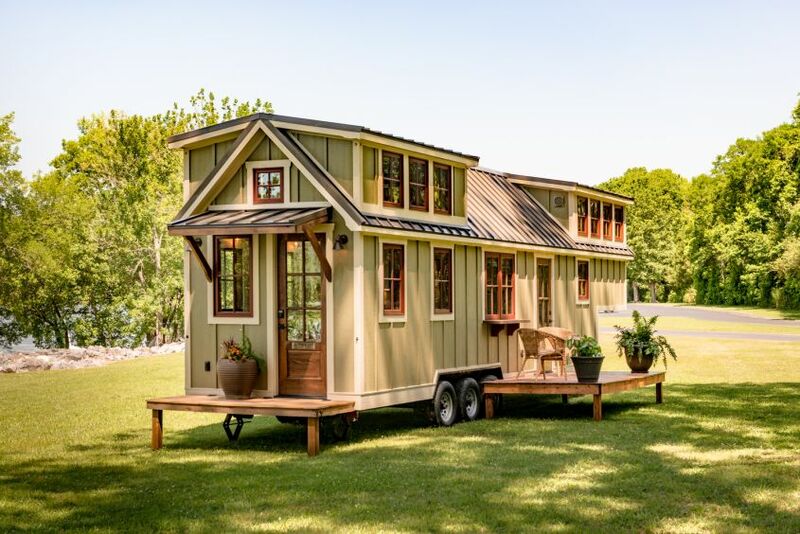 Made by Alabama-based Timbercraft Tiny Homes, it is a good-looking tiny house that can accommodate a family of six. 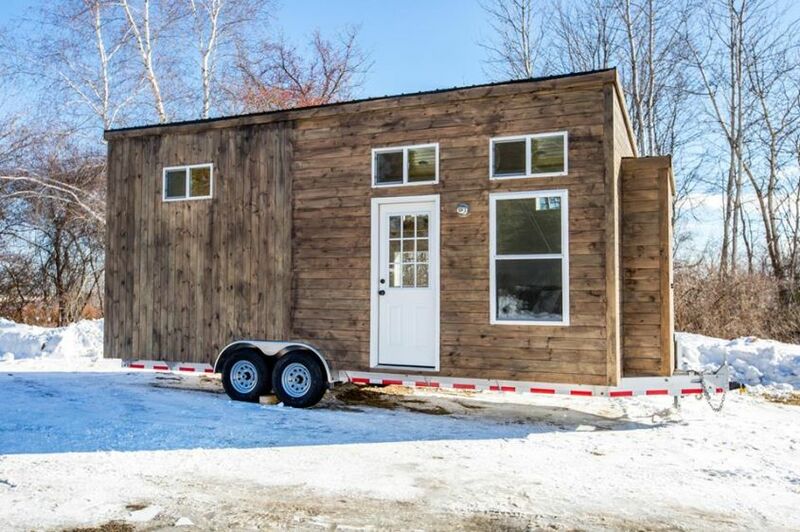 It is slightly bigger than traditional tiny homes but can be transported to different locations. 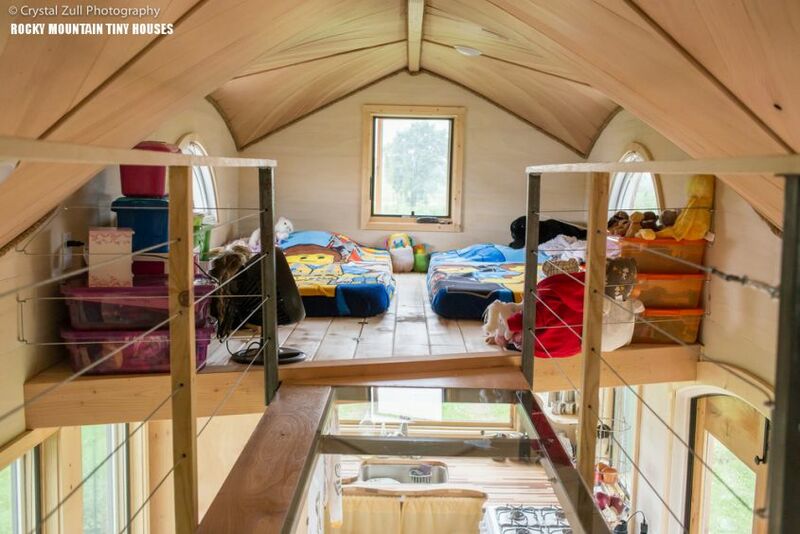 On the inside, there is a living room, kitchen, bathroom and three sleeping areas. The interior is so well furnished that it feels like a full-size home. 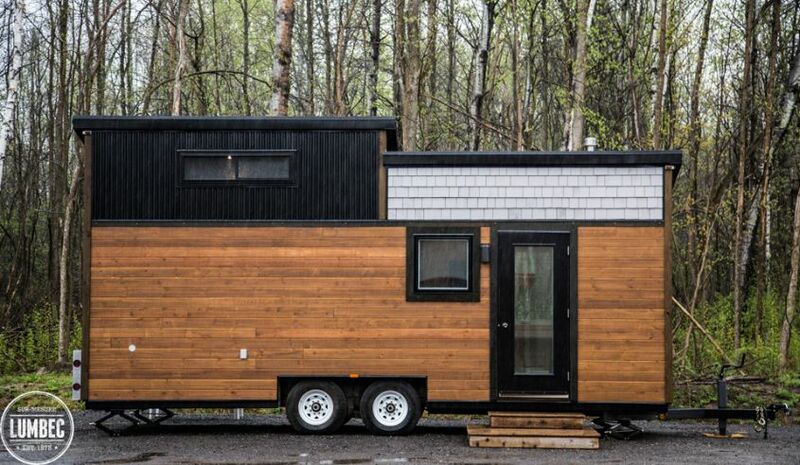 This contemporary tiny house on wheels sits on a 20-foot trailer. 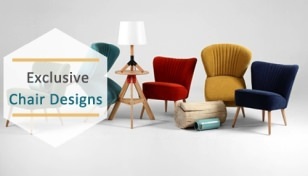 It can be customized with different hardware kits, appliances, living areas, and colors. 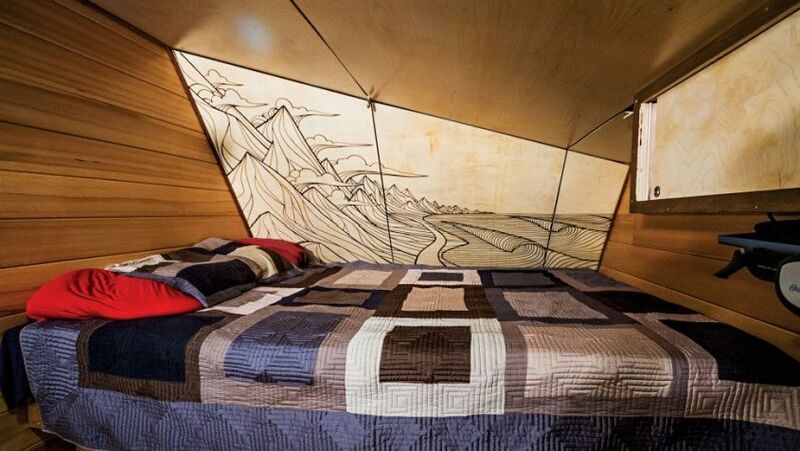 There are two lofts to create enough sleeping space. The simplistic wood-paneled exteriors with a number of windows add a touch of sophistication to its façades. 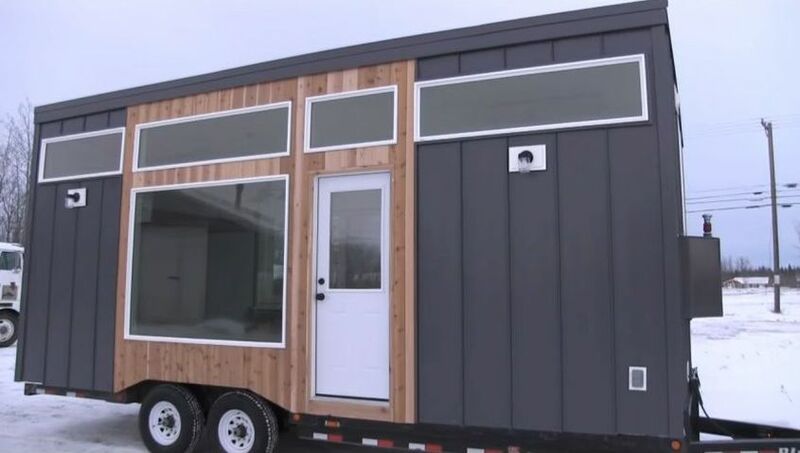 It is an upgraded version of the tiny home built by Canadian Leaf House in 2012. 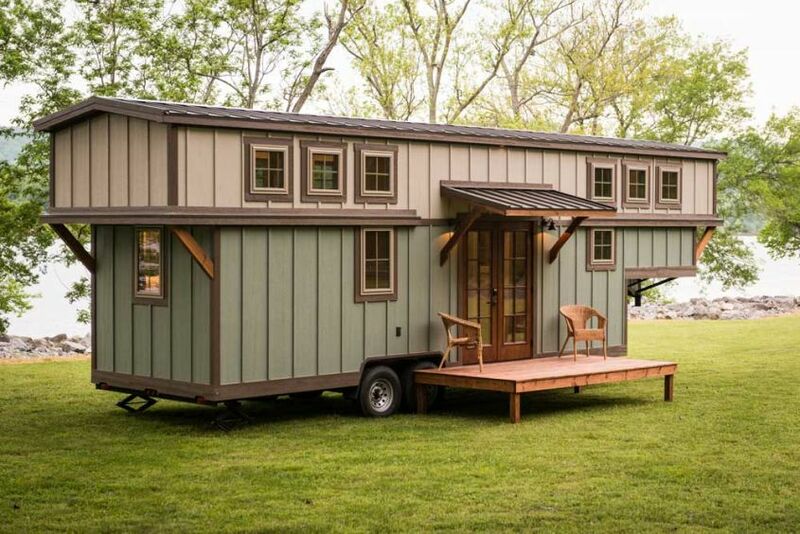 Although it looks small but has ample space to accommodate a family of four. 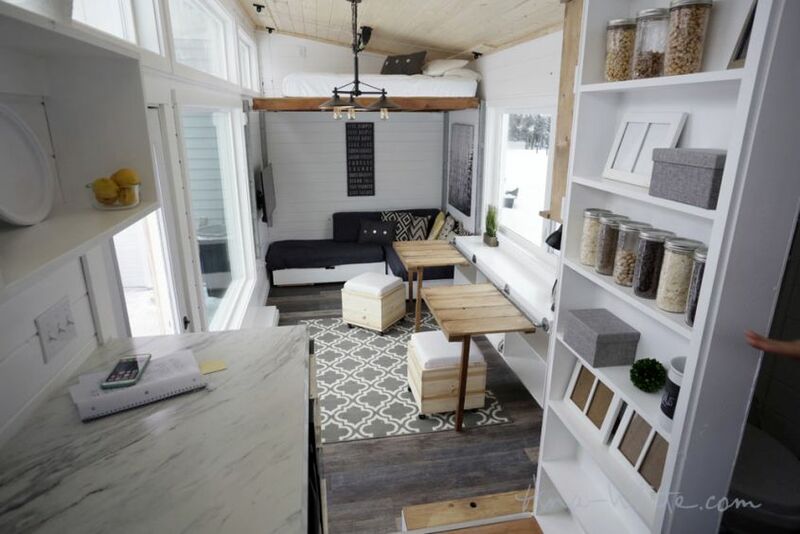 The innovative loft that allows standing up beside the bed is a cool feature of this tiny house on wheels. 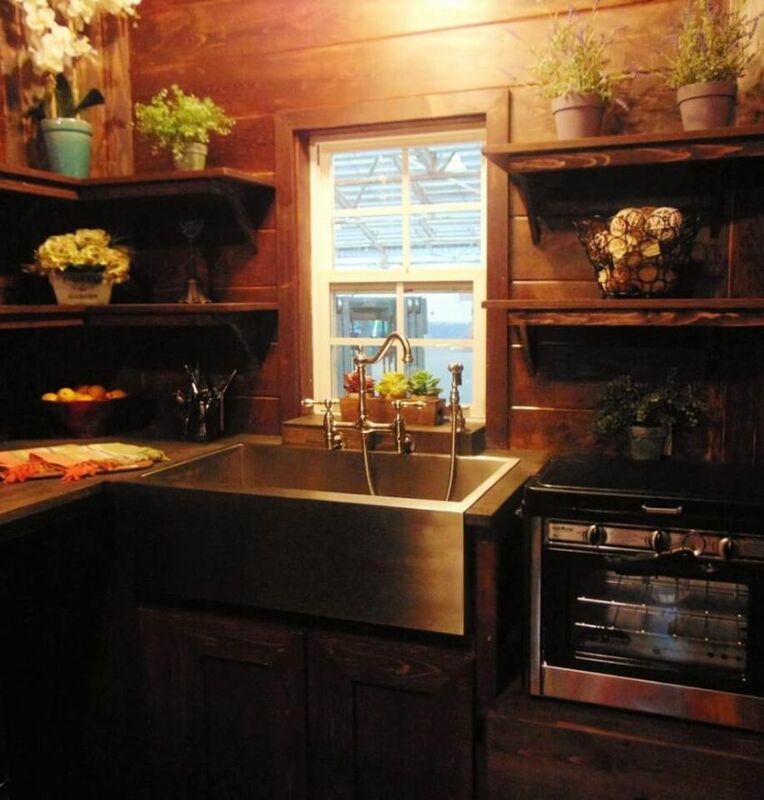 This 125-square-foot, two-story tiny house is made entirely of wood and designed to look like traditional homes by a US couple, who left their tedious jobs to live their dream life on the road. 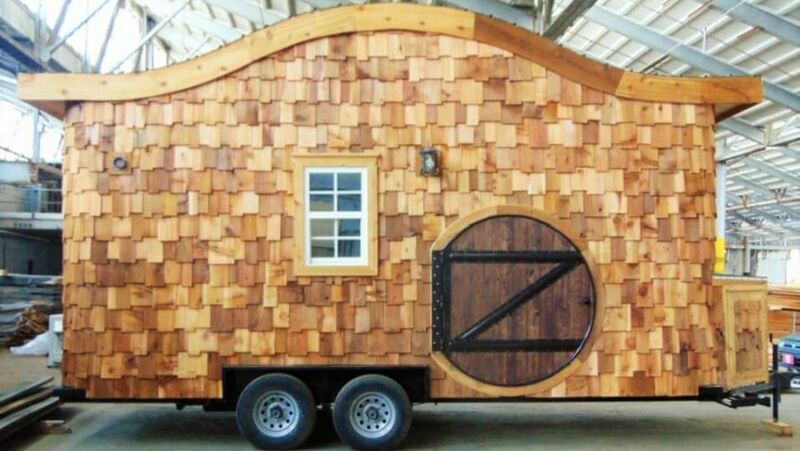 The reclaimed barn-clad exteriors add a whimsical touch to its overall appearance. The couple has installed a wood-burning fireplace to toast their toes in winters. 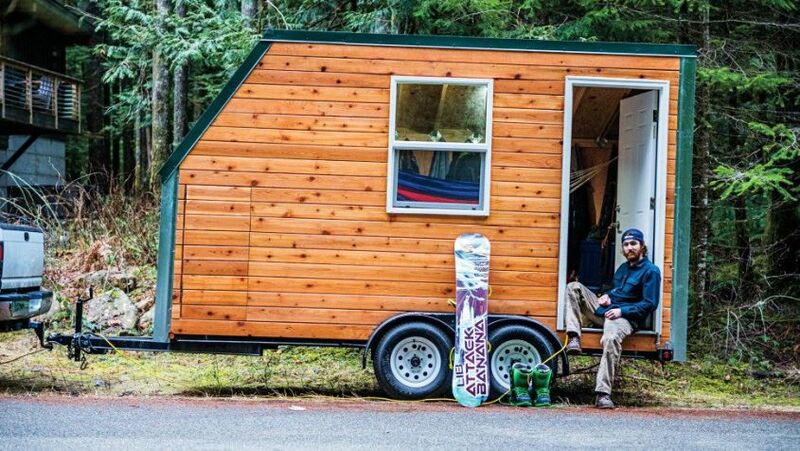 Pacific Northwest snowboarder and a pretty capable craftsman, Andy Bergin-Sperry has built this towable home using scraps sourced from his employer. 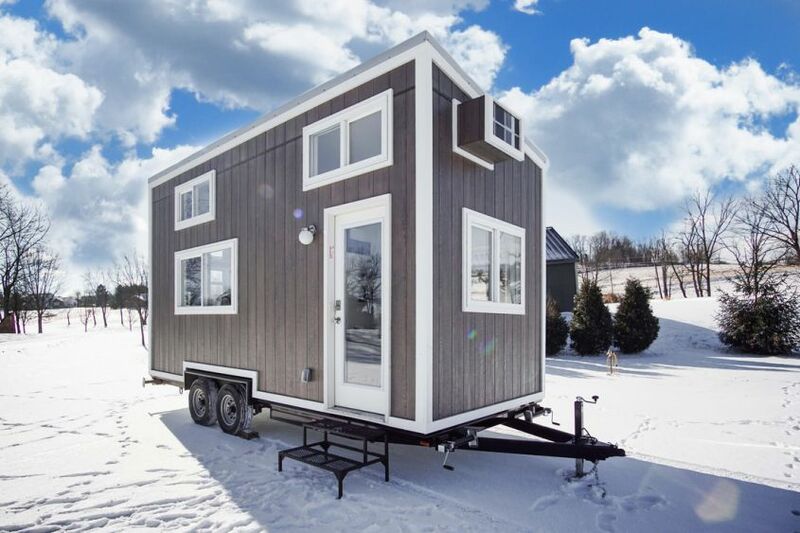 Built on a 14.5′ double axle trailer, it has a metal roof and a combination of corrugated metal and cedar siding on exterior. The interior is decked with bamboo flooring and birch plywood ceiling panels. 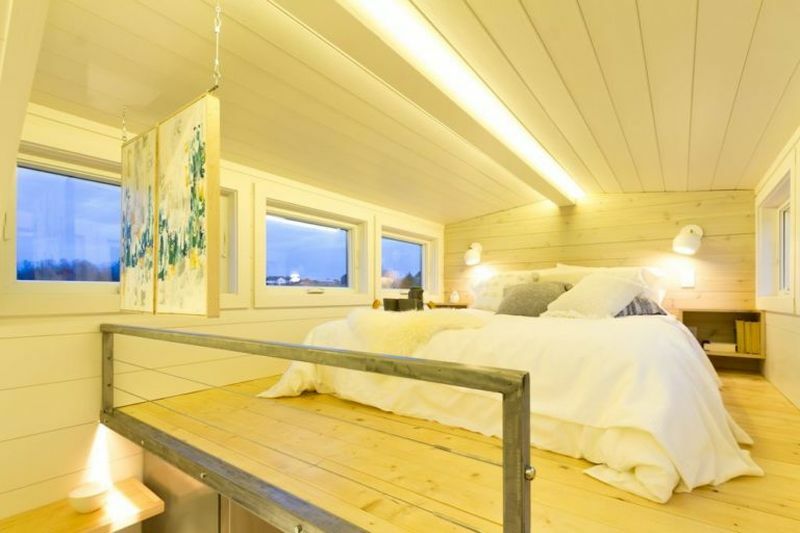 Perfectly waterproofed and insulated to withstand extreme weather conditions, the tiny house has a cozy loft bedroom with a muralled wall. 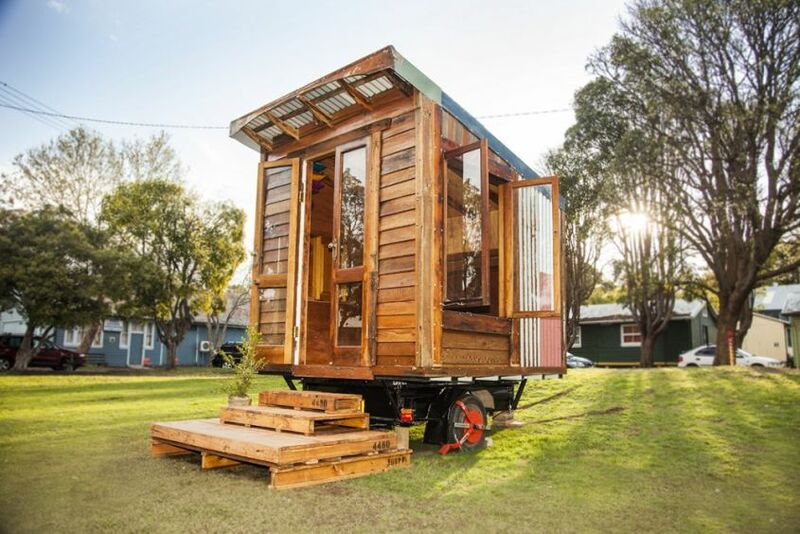 Australian builder James Galletly, also known as The Upcyclist, in partnership with Bower Reuse and Repair Center, has designed and built this small and cozy tiny house out of more than 95 percent recycled material. 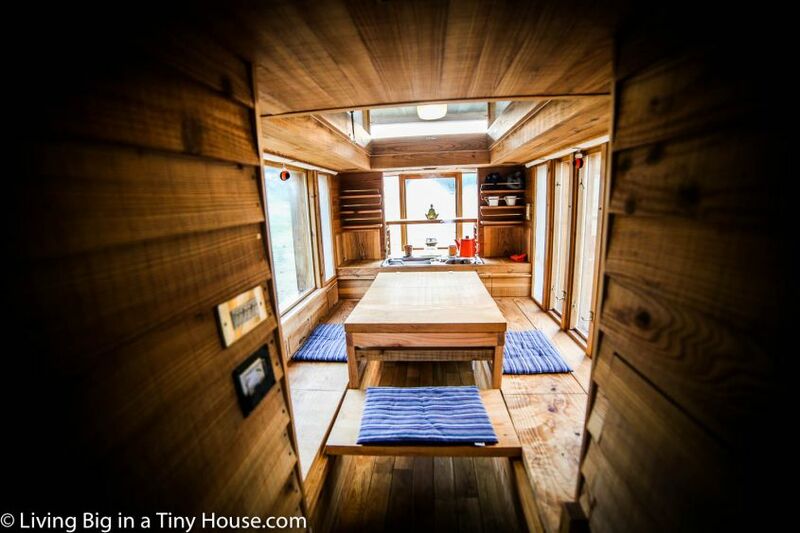 It has various eco-friendly and space-saving features, including fold-up bed and pallet wood stairs and deck. 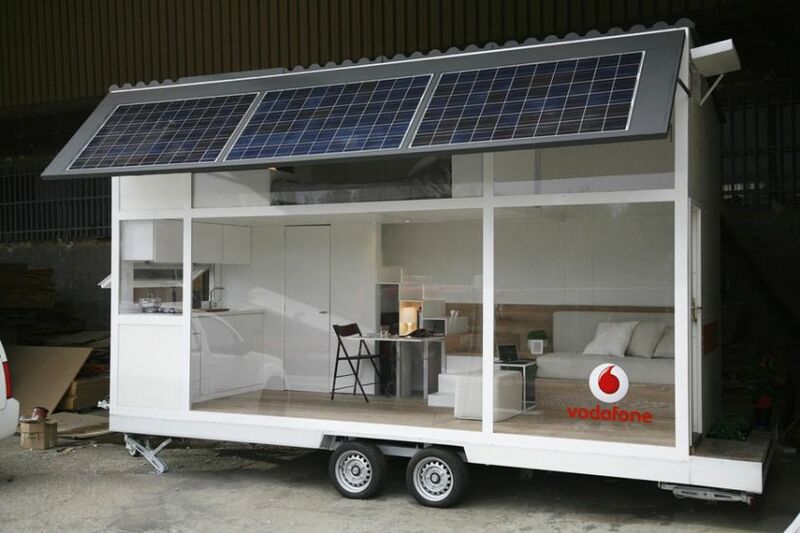 Waskman Design Studio and Culdesac created this movable tiny home for Vodafone. It is made from white polyethylene panels and transparent polycarbonate. 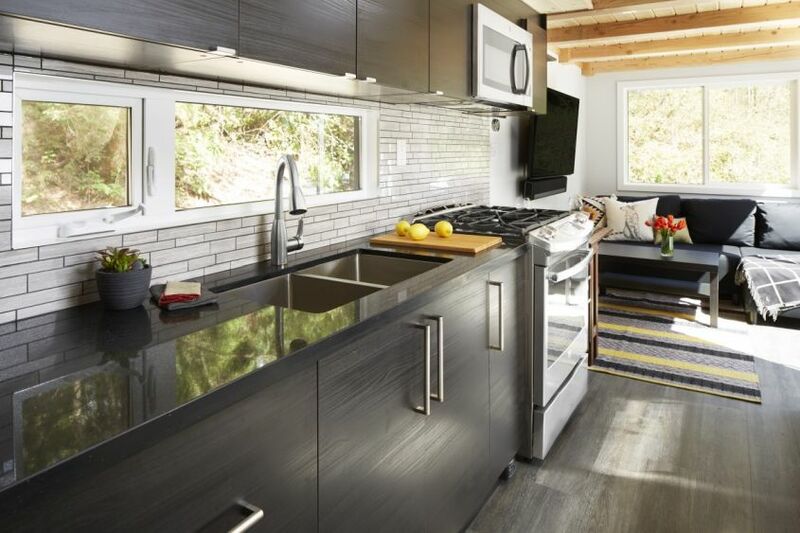 The large glass façade with solar panels is the unique design element of this tiny house. It is equipped with all necessary amenities to accommodate four. The white interiors blend well with minimalist furniture units. 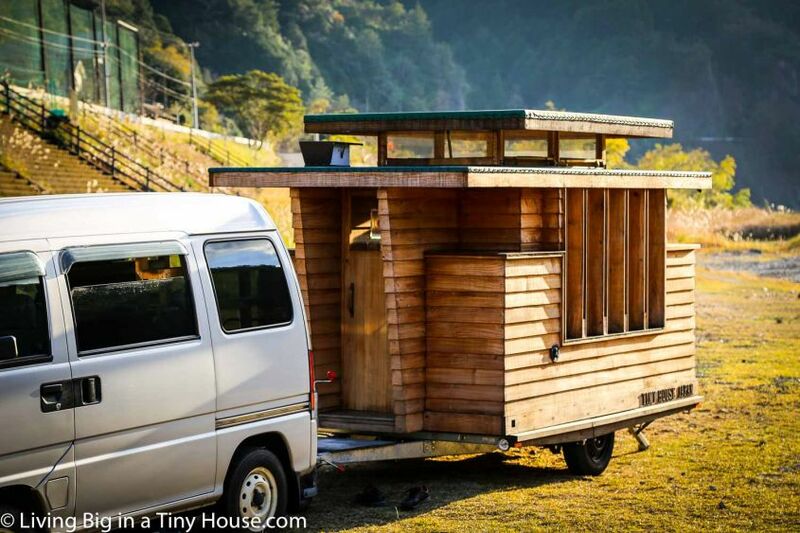 Made by Japanese craftsman Haruhiko Tagami, this lightweight tiny house on wheels is built using locally sourced materials like cedar. It has an architectural edge which seems to combine the work of renowned architect Frank Lloyd Wright with Japanese craftsmanship. 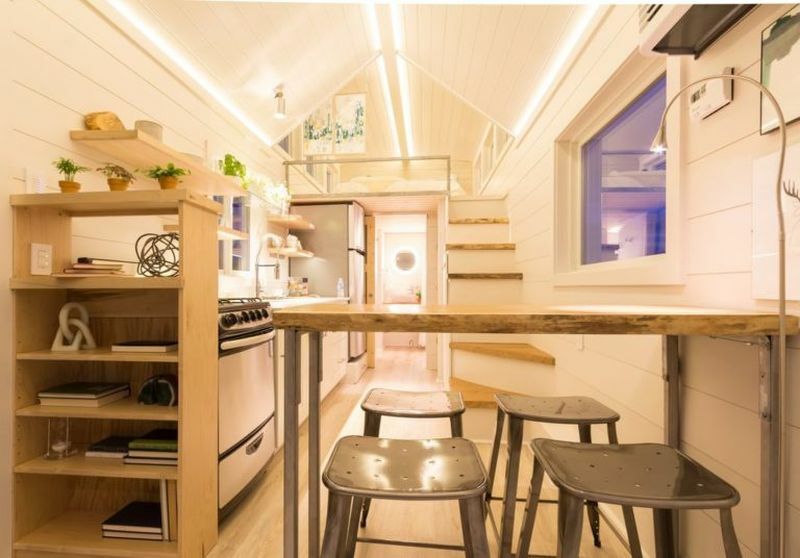 The most interesting feature of this tiny home is the transforming interior space to accommodate more in less. 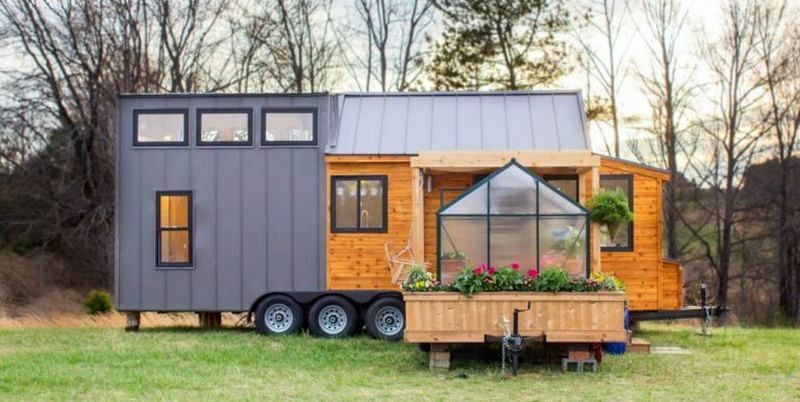 Contrived by Olive Nest Tiny Homes, this 323-square-foot tiny house on wheels comes with its own mobile porch and greenhouse. The exteriors finished with 1×8 cedar shiplap siding go well with the gray standing seam metal roof, and the four-panel glass door.